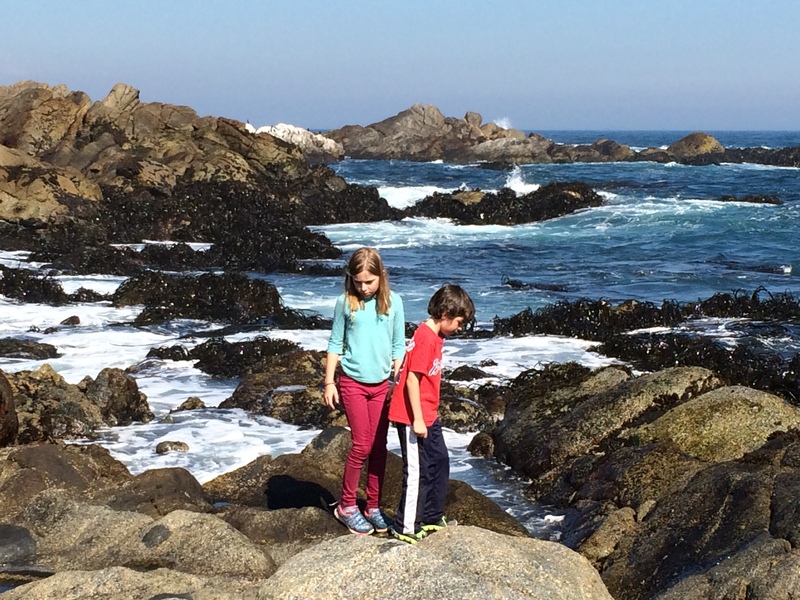 This past weekend we took a week off from Skiing to drive out to the coast to make the most of the Friday holiday. 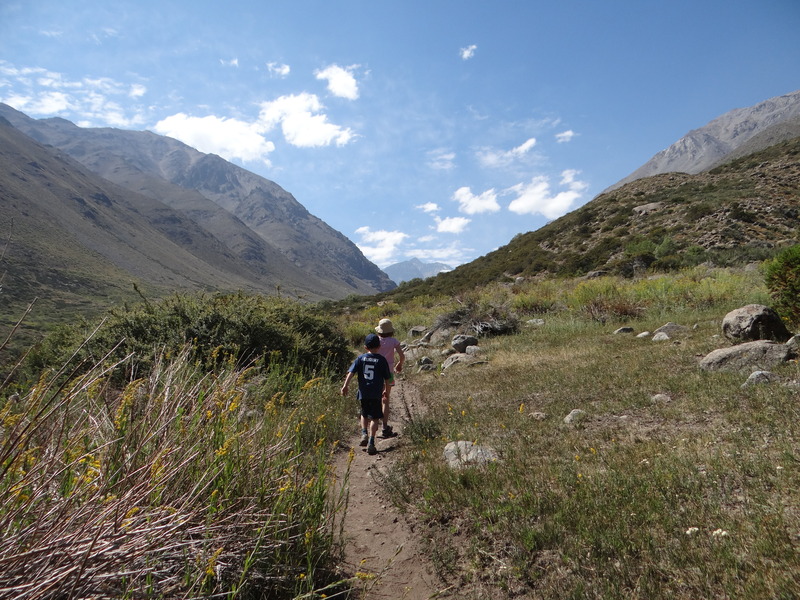 It is harder in Chile to do spur-of-the-moment trips because the most popular destinations are booked far in advance, which poses a challenge for non-planners like us. So we decided to take a chance on an off-season trip to the coast. Agarrobo, a small beach town south of Valparaiso, is most famous for the world’s largest outdoor swimming pool within the sprawling condominium development called San Alfonso del Mar Resort. We obviously did not chose Agarrobo for that reason. Instead, we thought it would be a great location close to the Casablanca Wine Valley as well as Isla Negra, another small coastal town known for Poet Pablo Neruda’s seaside home. 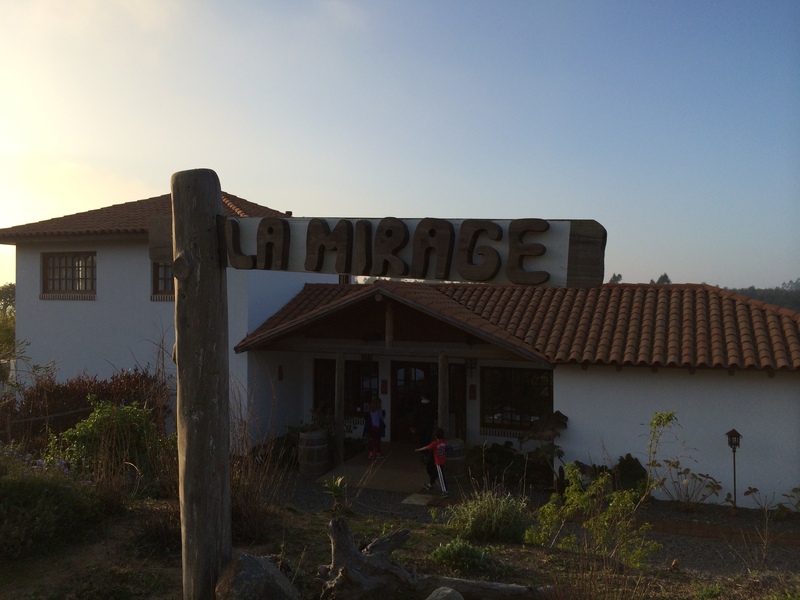 We found a small hotel, La Mirage Parador, located in-between Agarrobo and the Casablanca Valley off a small winding road. The hotel was quaint and intimate with just five rooms and each one faced an outdoor courtyard full of flowers and plants. It had a beautiful back patio where they served a lovely breakfast every morning. We were very pleasantly surprised. 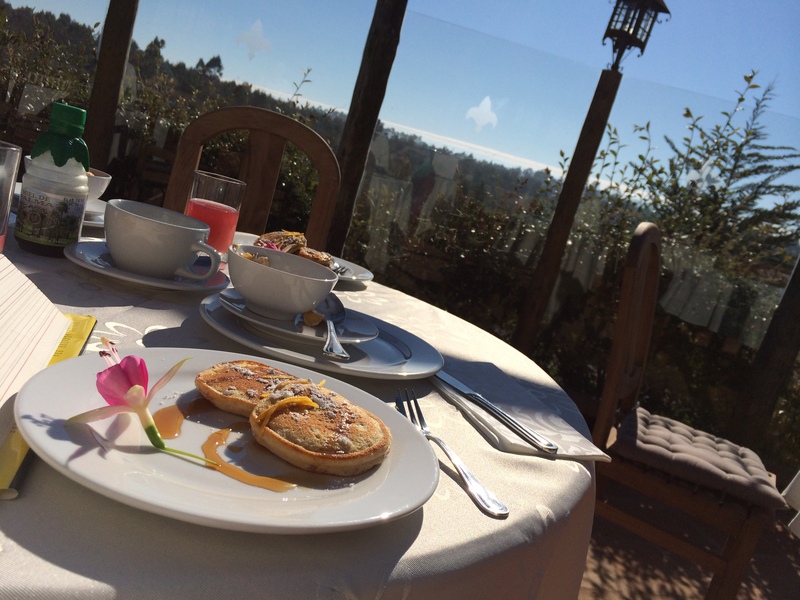 Hotels in Chile are typically very expensive and lacking. The only drawback here was that it still is winter and at night the rooms were very cold. Thankfully the weather during the day was beautiful and we were excited to explore the Wineries. Wine tourism here is still fairly underdeveloped in many areas. 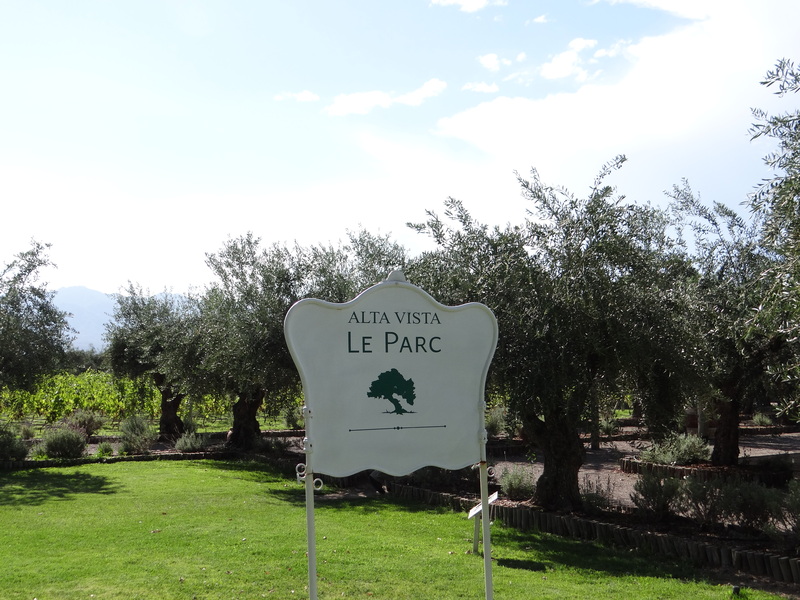 Visiting the Casablanca Wine Valley is not like visiting Napa. 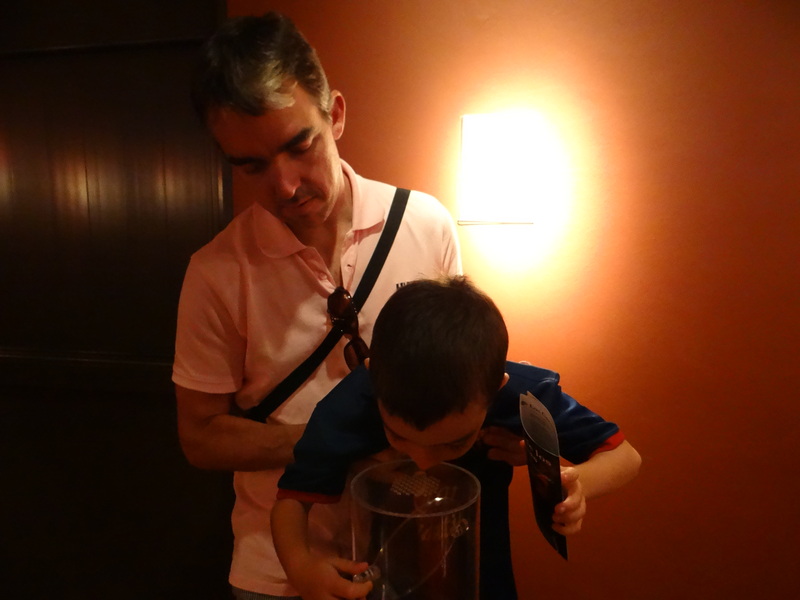 Our hotel had no information on the wineries less than 20 minutes away. You need to make appointments in advance to visit a winery (and some don’t answer the phone when you call) and many of the smaller wineries are not even on the maps. There is a central area along Route 68 where the heart of the tourism is but it still has a way to go. As far as I can tell, you can only visit about 6 wineries in Casablanca. Some are worth a visit but others are mass producers who won’t prove very interesting for those who have visited other wine regions. 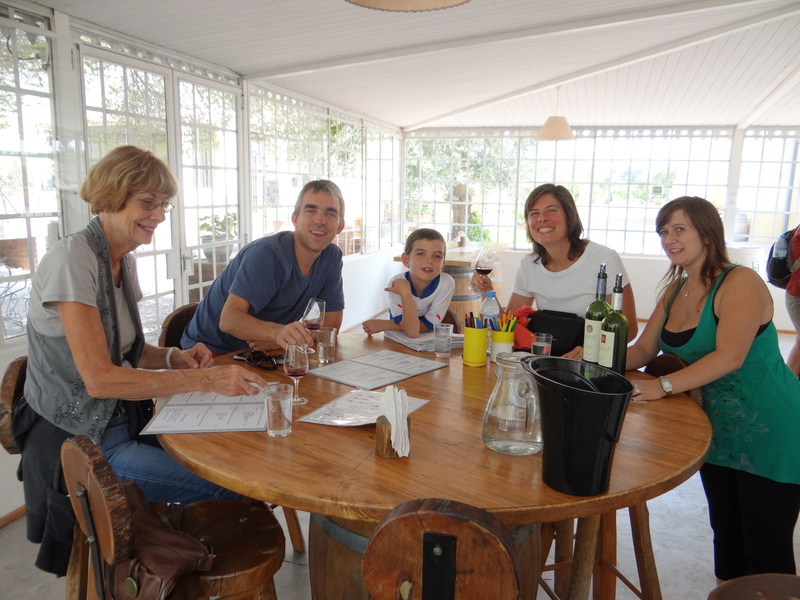 We do have a great restaurant we love called Casa Botha where the owner, David and his wife Carmen create a wonderful respite with thoughtfully prepared italian food with locally sourced Chilean ingredients. 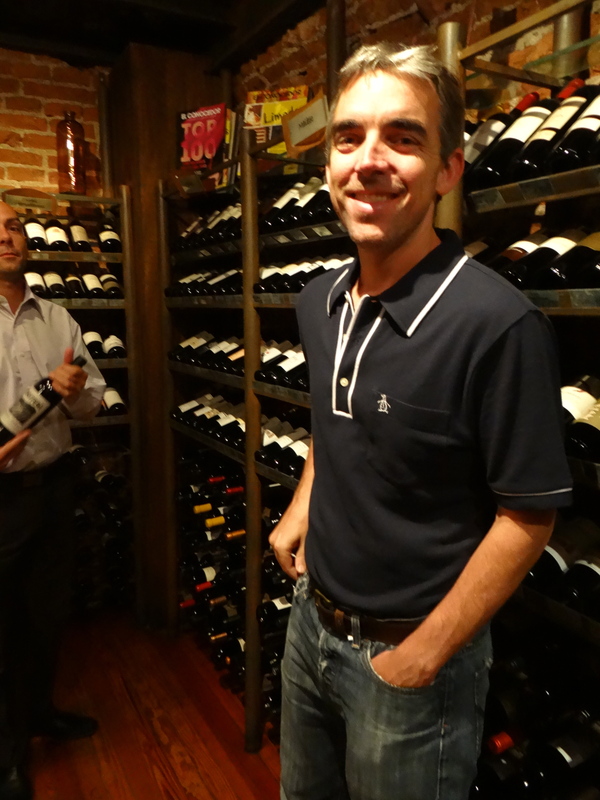 My favorite part of visiting David is that he gets all the good boutique wines from the Casablanca Valley – the ones you can’t find anywhere else. In fact, on most occasions, we find a winemaker at the restaurant, eager to share their passion about making wine on a small scale. After a day in Casablanca we headed to Isla Negra for a tour of the house of the the nobel-prize winning poet Pablo Neruda. I wasn’t familiar with Pablo Neruda before coming to Chile but he really is a remarkable figure. He is so essential to the history of this country as went on to have a long diplomatic career. Neruda was a well-known communist and had to flee the country at one point with his family. In fact, many speculated that his death was a conspiracy by the Pinochet regime given that he died just days after the military coup. The theory gained so much traction that his body was exhumed and toxicology tests were conducted. The results confirmed that Neruda’s death was from natural causes but the stories still persist. Needless to say he is a very interesting character. 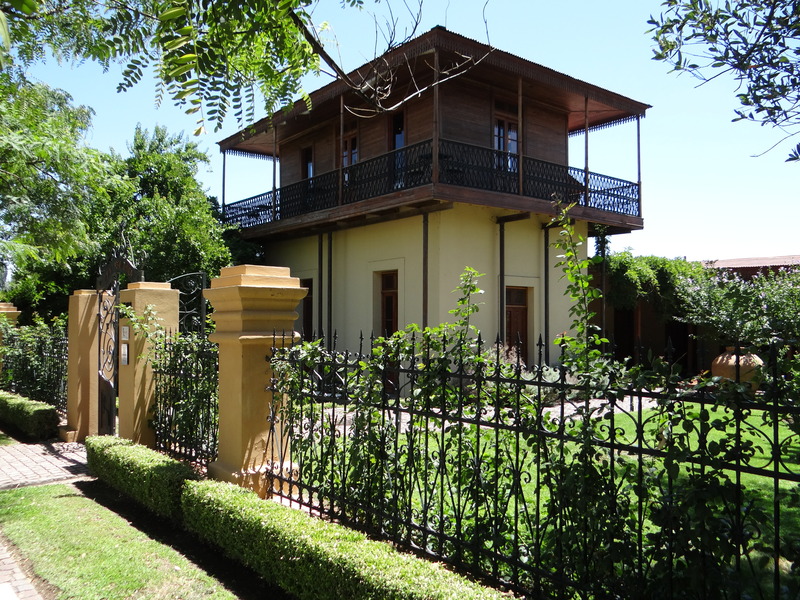 Neruda has three houses in Chile. 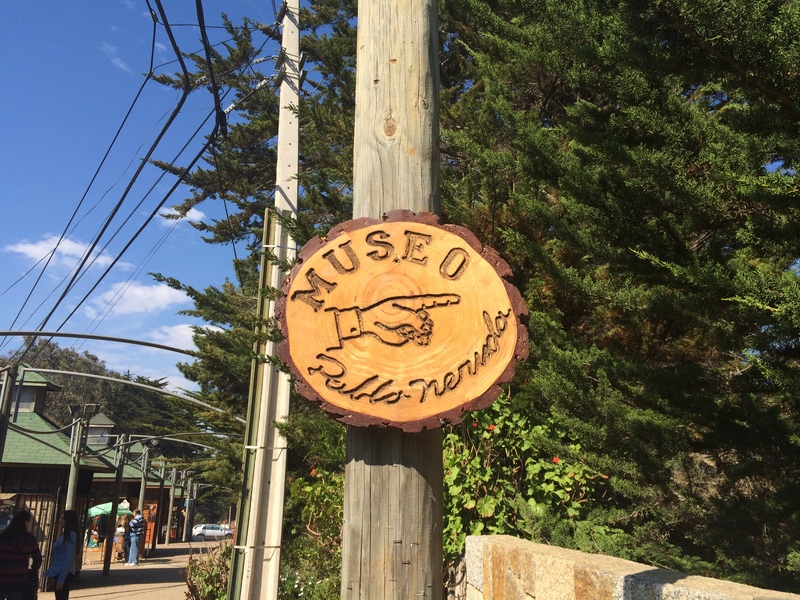 One in Santiago, one in Valparaiso and a third in Isla Negra. While all three are worth a visit, the Isla Negra house is perhaps the most beautiful because it sits on a cliff overlooking the ocean. 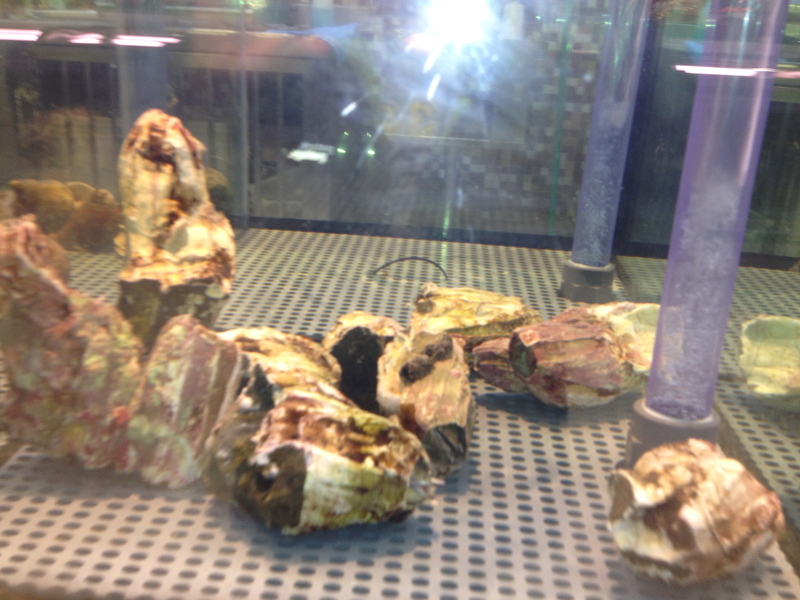 It also displays many of his famous collections including his seashell collection. We learned there would be a two-hour wait to enter so we took some time to explore the vendors situated on the path to the house. 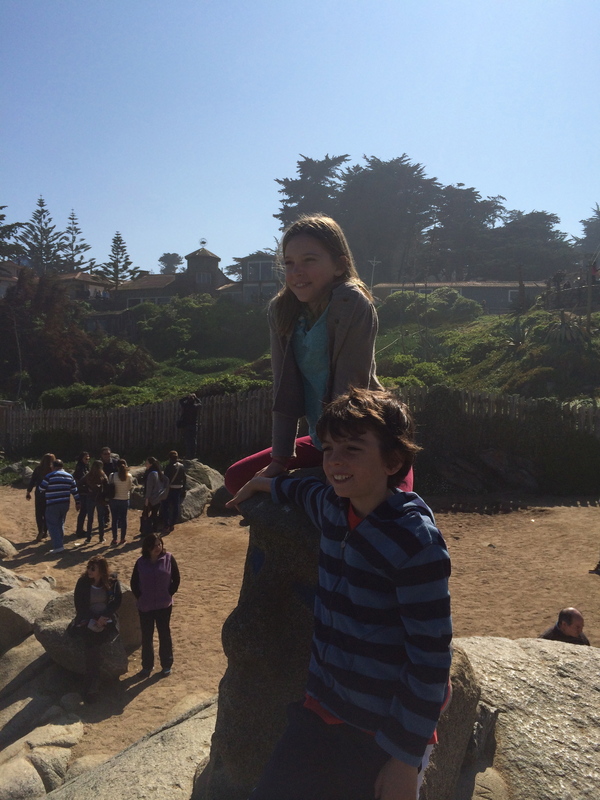 We also found a marvelous beach cove with tons of rocks to climb. The kids might have liked this as much as the museum. When it came time for the tour, we all decided to take the spanish tour (except Jack who got his headset programmed for English). 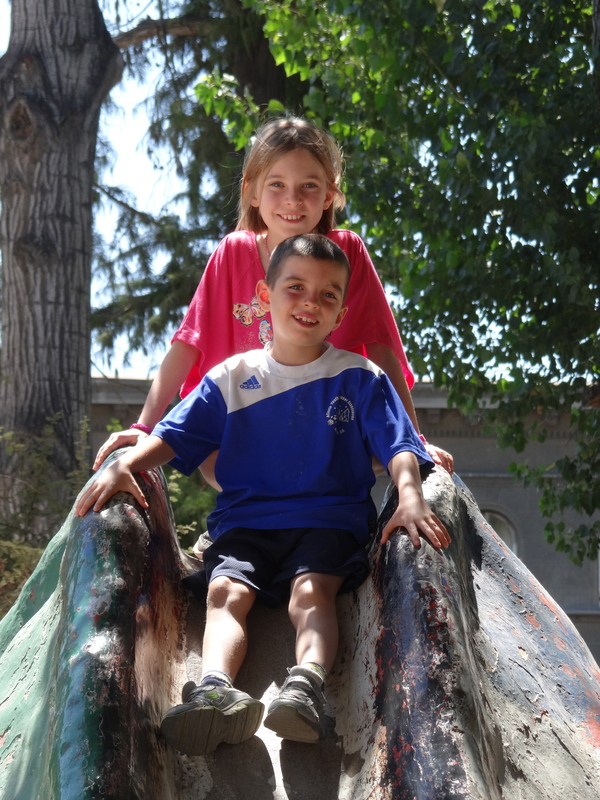 Just more than two years since arriving in Chile, Madie is now part of the National program at her school which means she no longer takes Spanish as a second language. John and I are relentless at efforts and finally gaining some comfort. All that said, the three of us had a hard time understanding the tour. I finally cheated and borrowed Jack’s headset for one of the rooms. We called our last-minute getaway a great success. Chile is one of the most geographically beautiful places I have ever been. 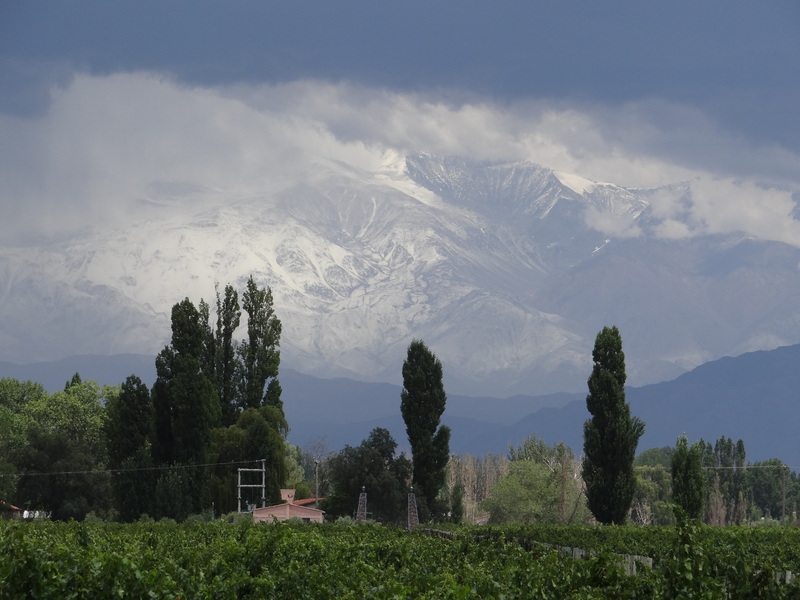 The fact that we can ski in the Andes just an hour from our house and the next weekend be at the beach in 90 minutes -with a visit to a wine region in-between – really sort of lovely. 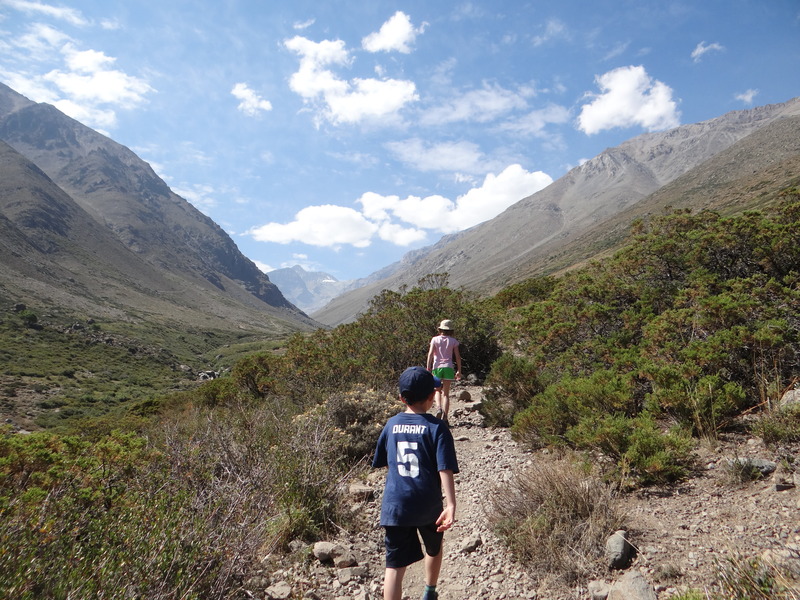 This year for the Chilean holiday of Dieciocho we decided to head to Peru. 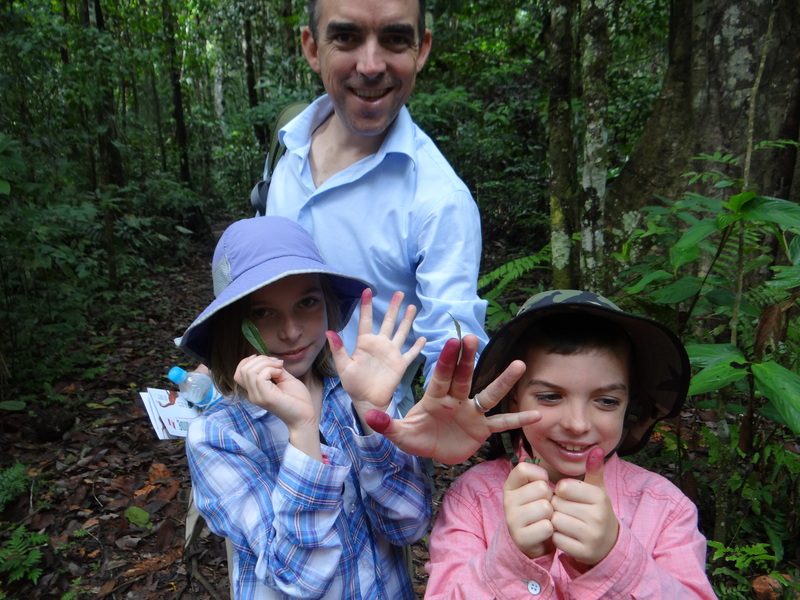 Kids get a week off from school and it is still the dry season in the Rainforest. 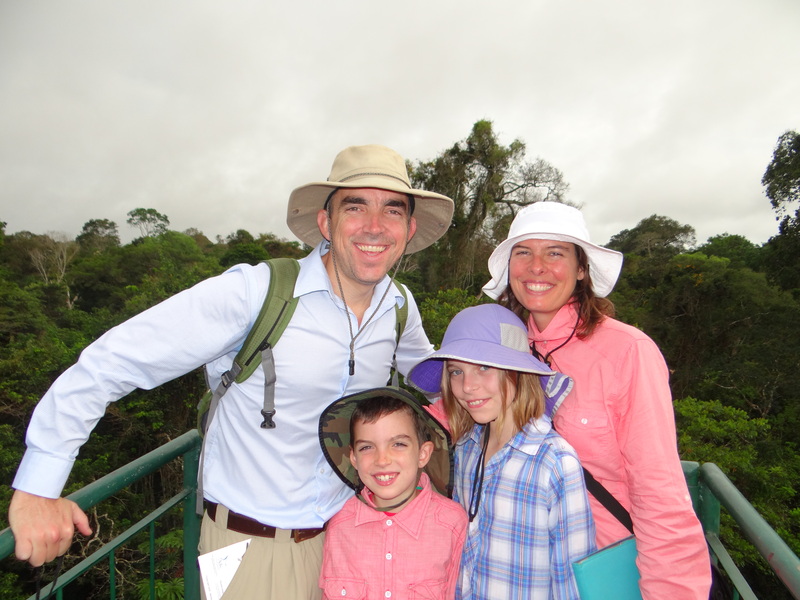 As we try and hit all of the highlights in South America, the Rainforest was sure to be on the top of the list. We flew to Lima from Santiago (3.5 hour flight) and stayed the night in Lima. I had been so excited to visit Lima. It is one of the foodie hotspots on the globe at the moment. So much exciting cusine happening and we are fortunate to have friends who just moved to Lima. 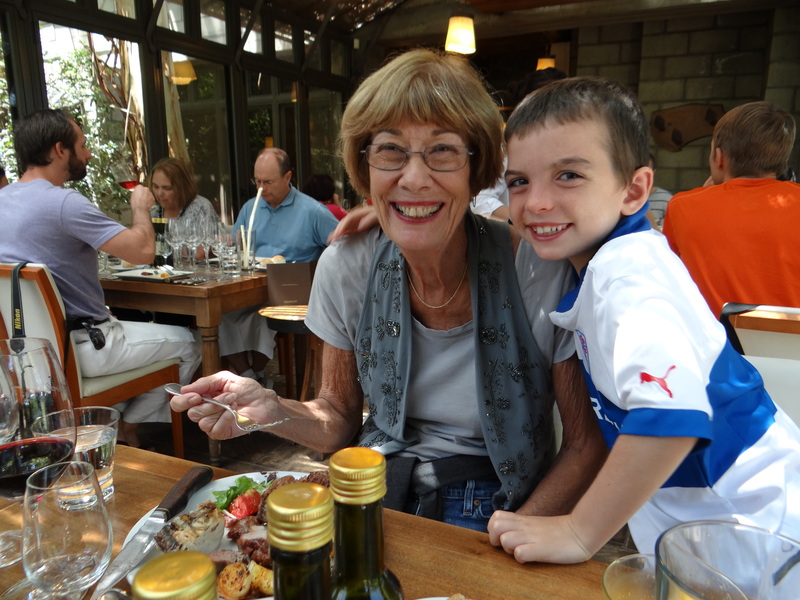 Our plan was to go out to a great restaurant and let the kids hang out at home with their nana. As we landed in Lima, we saw the blue sky vanish when we got low enough to the ground only to be surrounded by a brown haze. Once on the ground, the chaos of rush hour in Lima was nerve-racking. There were moments when we were hurling down the road with no regard for any traffic laws, lines or other drivers followed quickly by abrupt stops and creeping at a snails pace through incredible congestion. Because of the traffic, it took us more than an hour to reach our hotel. Beautiful is not the first word I would use to describe this city. 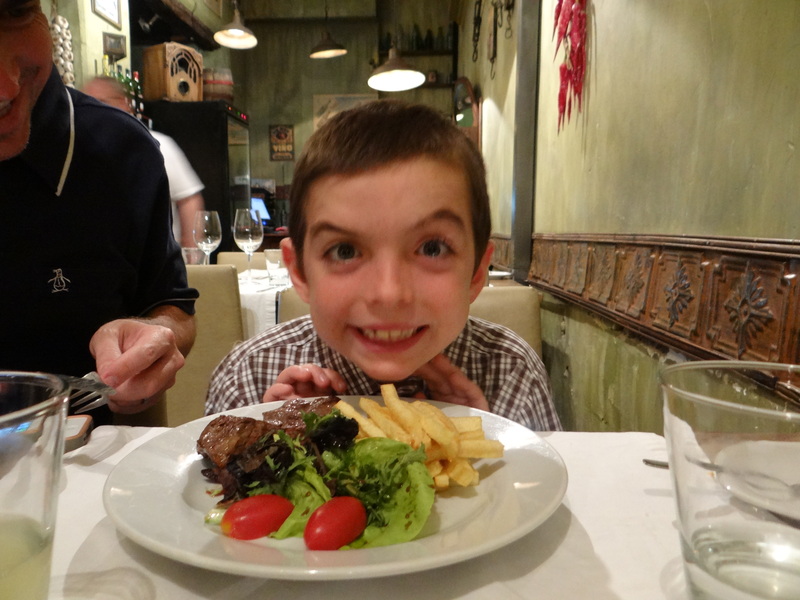 But, our dinner at Pescados Capitales was phenomenal. Talking to our friends, the food scene in Lima really is all that people say it is and more. It was just sad to have only one night. 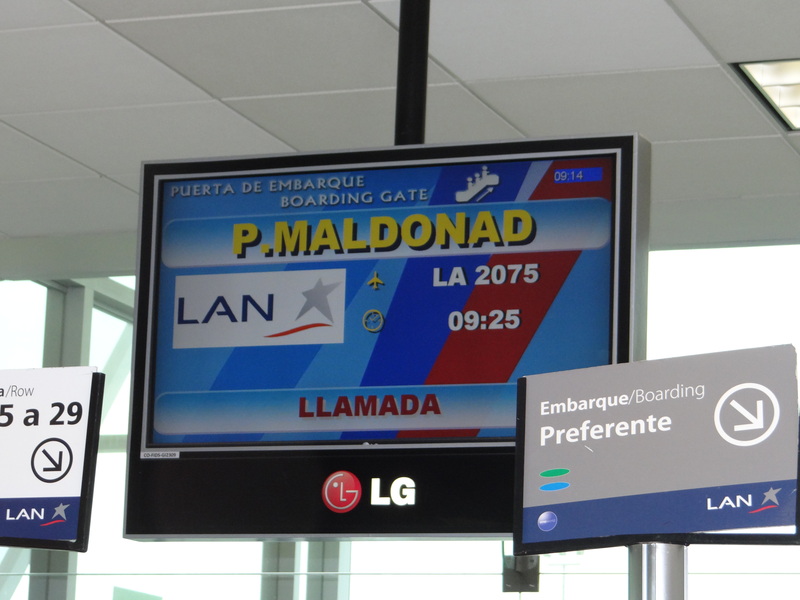 The next morning we headed out to Puerto Moldanado. The flight would land in Cusco but continue on to the small town in the heart of the Amazon River Basin. Our captan on the flight admitted that the rain was so bad he would only be able to make one attempt at landing and we would likely have to return to Cusco. By the grace of god his one attempt worked and we landed into a total downpour of rain. 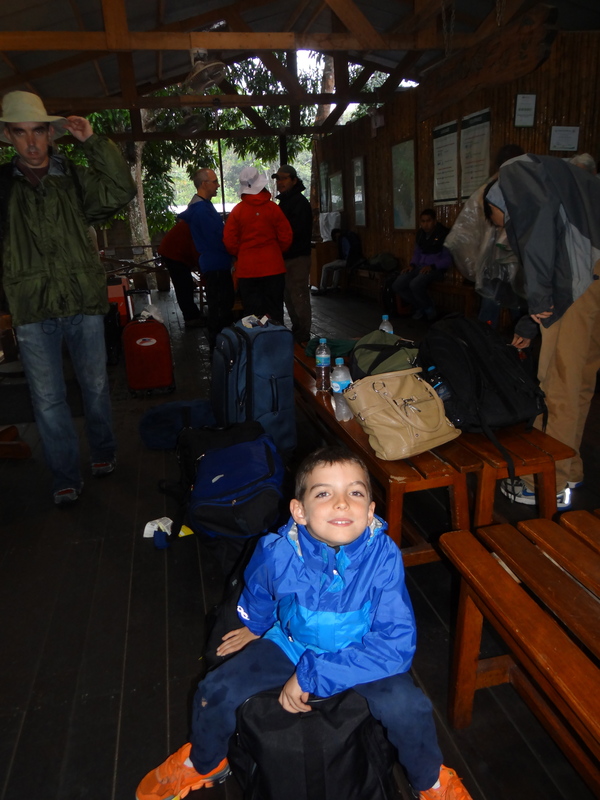 We got on a bus and headed to the Rainforest Expeditions main office in town. Since we would be traveling down the river in boats which resembled large canoes with roofs you could only bring a few small bags. We had to unload our other gear at the office and pick it up after we returned. We got out our rain gear, flashlights, etc. and got back on the bus to head to the river bank. The rain was coming down in buckets. We were completely ill-prepared. We had on tennis shoes and jeans. Big mistake. There was a relatively high bank of the river that we had to traverse to get down to the boats and the river bank was complete mud with no steps of any kind. While the rain made getting to the boats nearly impossible without sliding down, there did not seem to be a back up plan. One by one we tried to make it carefully down the bank and one by one, we slid in the mud and pouring rain to the bottom. Now, absolutely covered in mud, wet and cold, we got to take the 4.5 hour boat ride to the lodge. 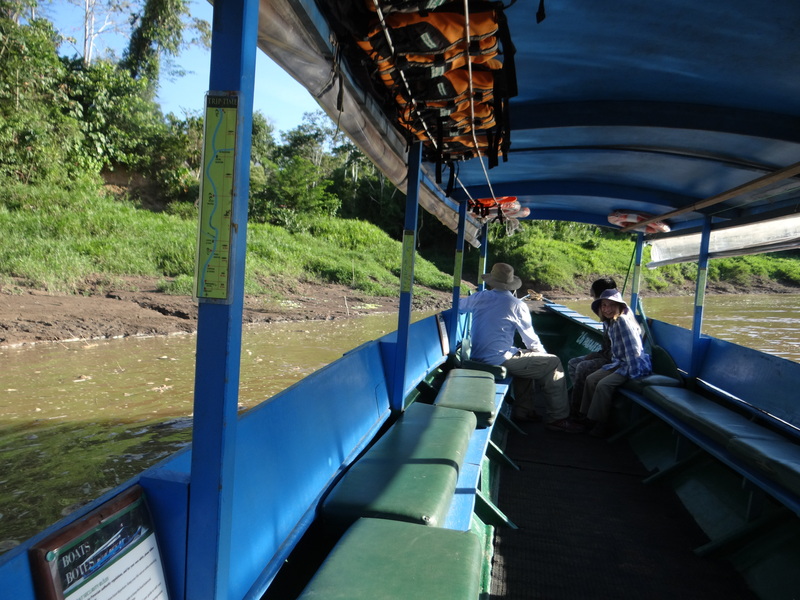 According to our guide, they typically cut the trip time down by taking the first part of the journey by road, but the road had washed out so we would do all 4 hours by boat – the last hour in total darkness because we had landed late and night was drawing near. It was absolutely the longest 4.5 hours. The kids were losing it entirely. There was really nothing to do but sit and think and Madie had seen a giant wall-sized poster in the airport warning visitors of Dange Fever so she just worried the whole way about the family coming down with this crazy jungle disease. I was also full of dread given that the last hour we relied on one of the guides holding up a strong flashlight off the front of the boat trying to point out any big rockes, river banks and turns of the river. The river is incredibly shallow at many parts so I just imagined us getting stuck knowing that pirranah were an abundant species in this part of the world. We finally made it safely to the lodge. We had to take our our flashlights and hike about half of a mile through complete darkness to reach the main lodge. 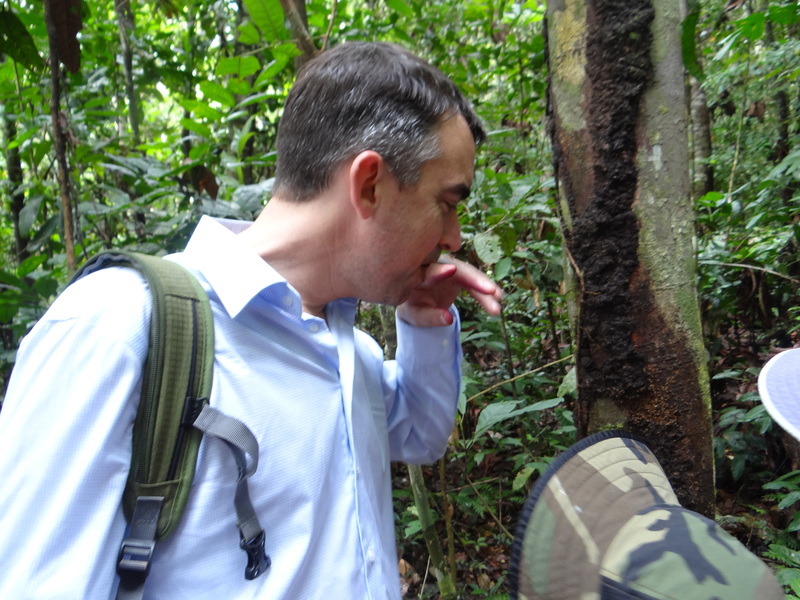 The sounds in the jungle are almost overwhelming. It seems as loud as New York City but with each sound being some animal marking its territory, calling its friends or courting a significant other. There is no electricity. They have some electricity in the main lodge for a few hours each evening but none in the rooms. They have candles and gas lamps for the main part of the evening. 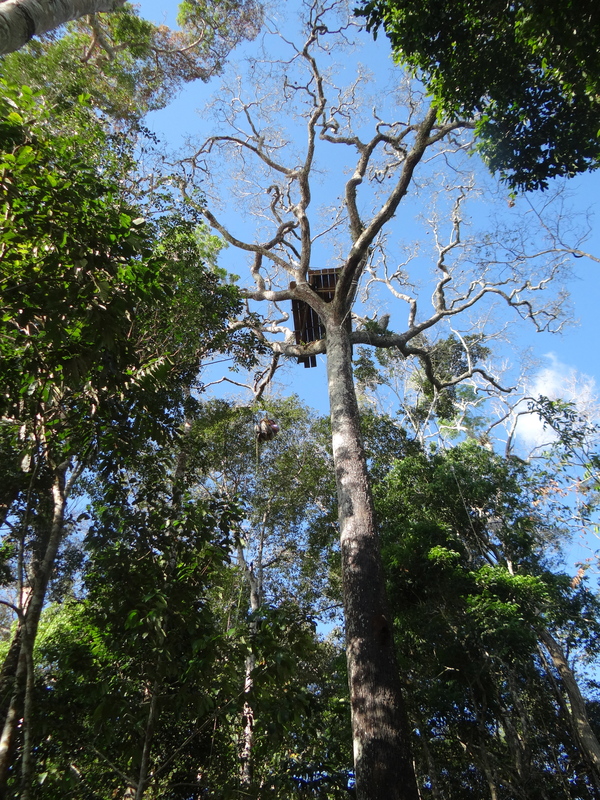 Rooms are completely open – each bed has a mosquito net they put down in the evenings but you are totally open to the jungle. We were completely off the grid. 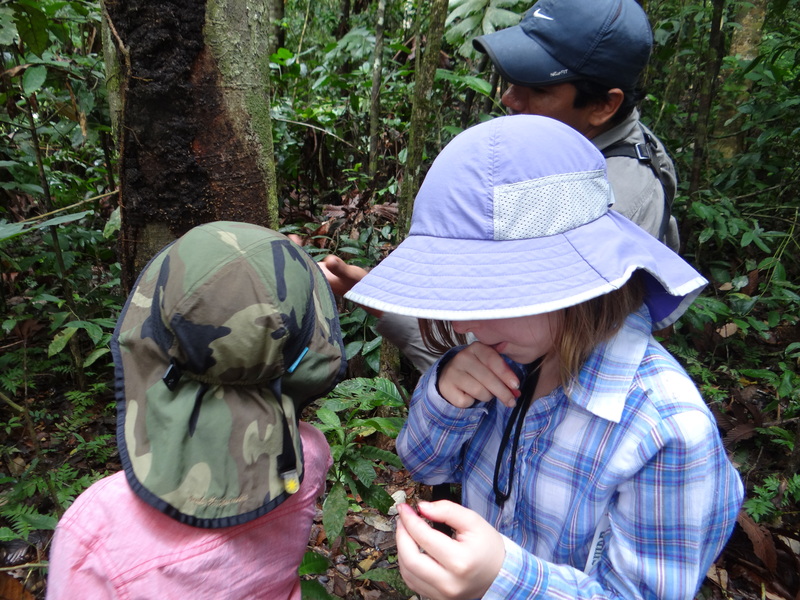 Rainforest Expeditions is the company we worked with to plan our trip They run three lodges in the Amazon Basin. 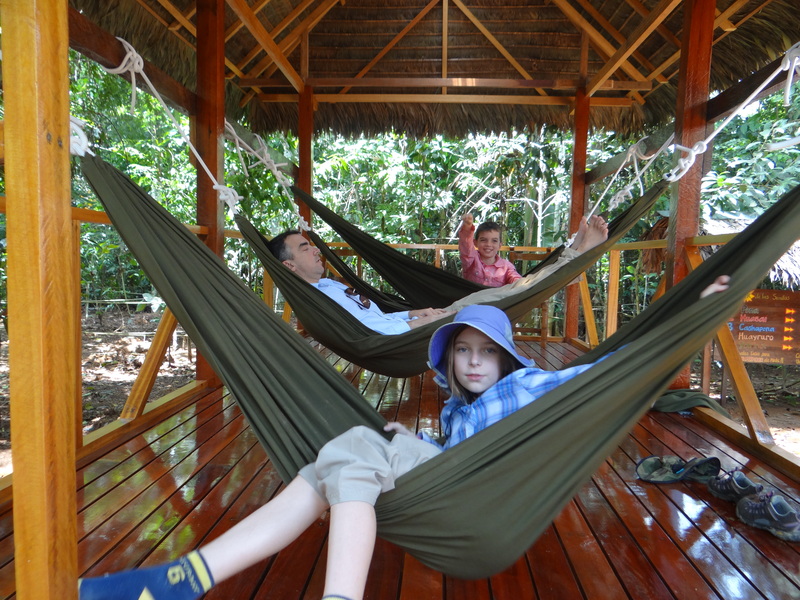 We were staying in Refugio Amazonas the lodge which is the more family-oriented option and mid-range distance from the main town of Puerto Moldonado. They have a lodge much closer to town and another four hours from our lodge (so more than 8 hours up the river) and noted as one of the most remote lodges in South America. The Refugio Amazonas lodge was very basic – a main area where we ate all of our meals at group tables, they hosted lectures each night and had a fun simple bar where people gathered for cocktails and drinks. 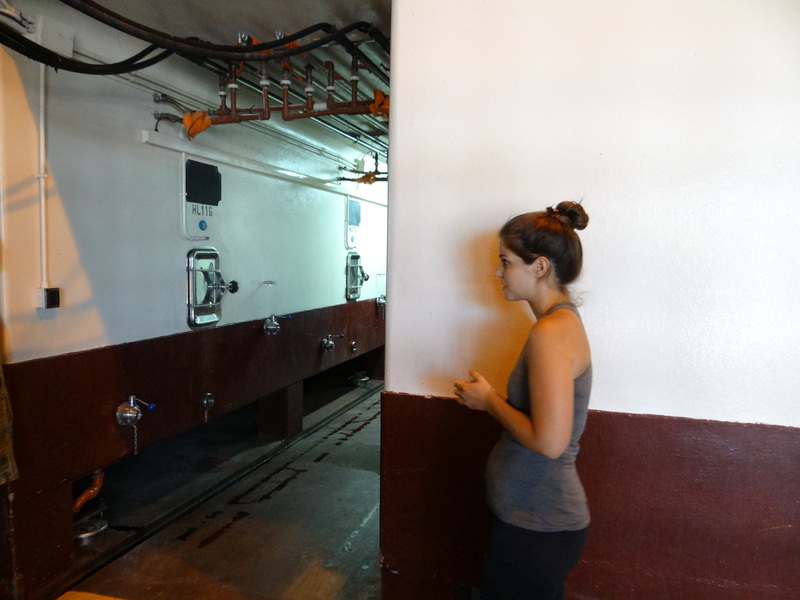 This was also the place they turned power on for a few hours each day in order to charge cameras, etc. Our guide Carlos was amazing and he led just our family the whole trip. He spoke English and Spanish but we tried to stick to spanish. Our first morning our plan was to climb up the canopy, a platform that was at the top of a giant staircase that took you above the tree canopy. 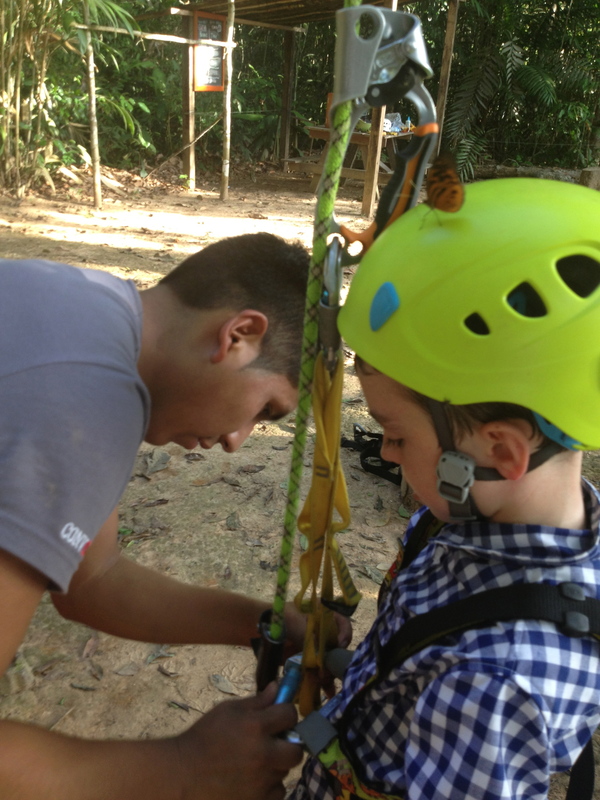 From the top, Carlos used his iphone to make bird and monkey calls. 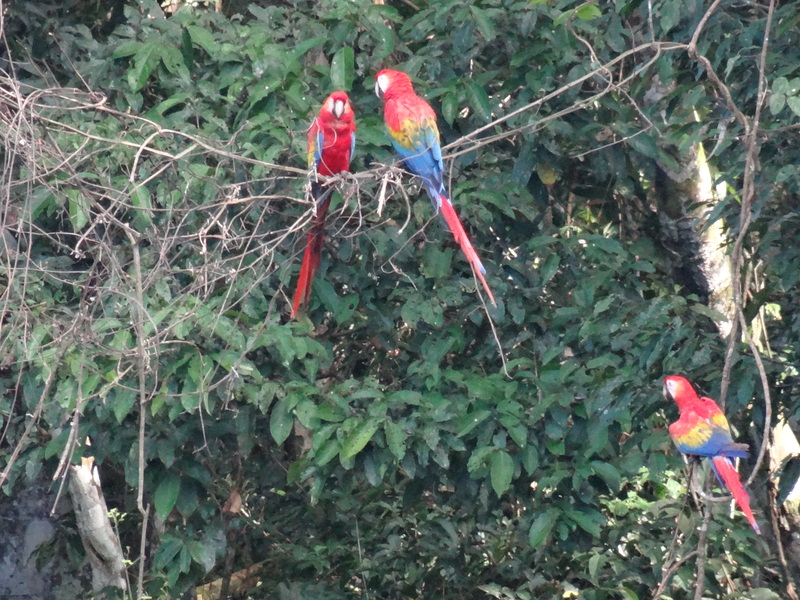 We could see toucans, macaws, parrots. Really amazing. 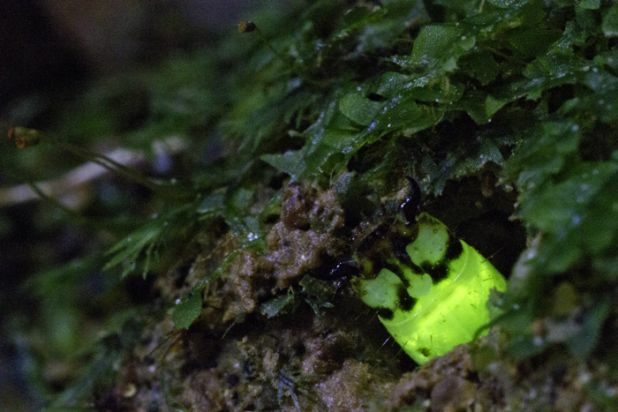 We then hiked a few miles to the Oxbow lake and on the way came across so many amazing things. 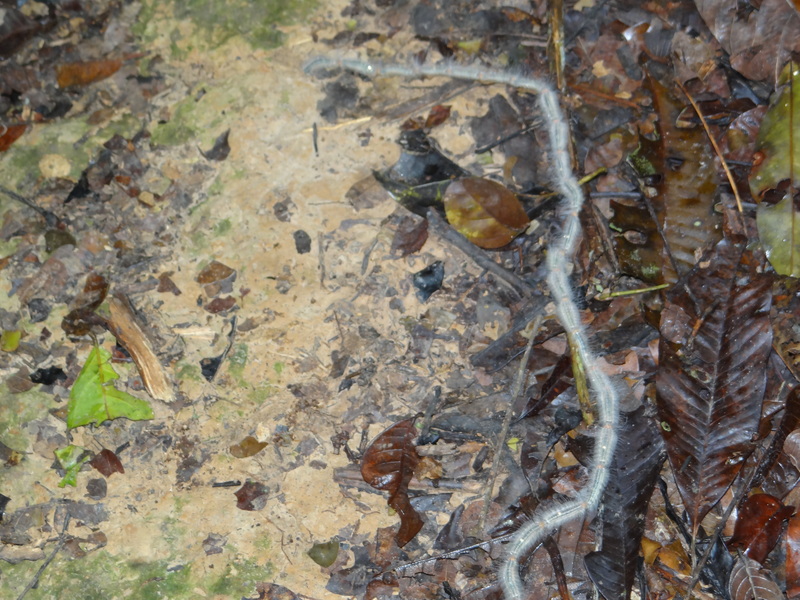 What at first appeared to be a thin feather boa on the ground turned out to be a group of caterpillars. The caterpillars produced a pheremone that attracted others and they all travled together in this long line one right after another. 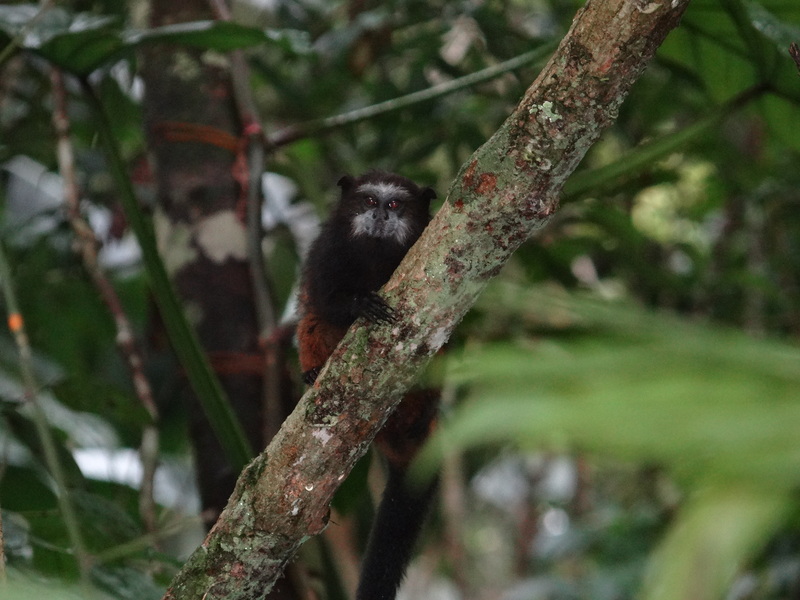 We found a family of Tamarin Monkeys who came to see what we were up to. 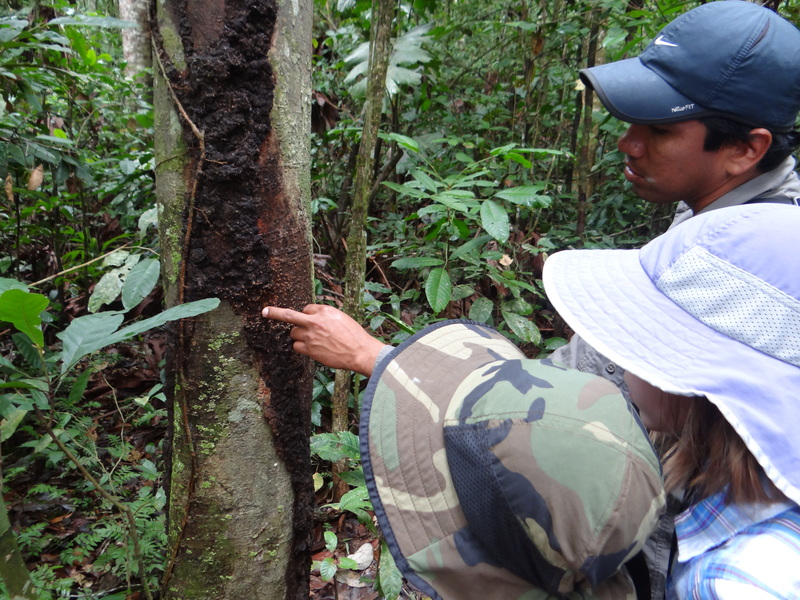 Carlos showed us a tarantula nest on the side of a tree. He took a small branch to touch the outside to see if the spider was home but it was not. 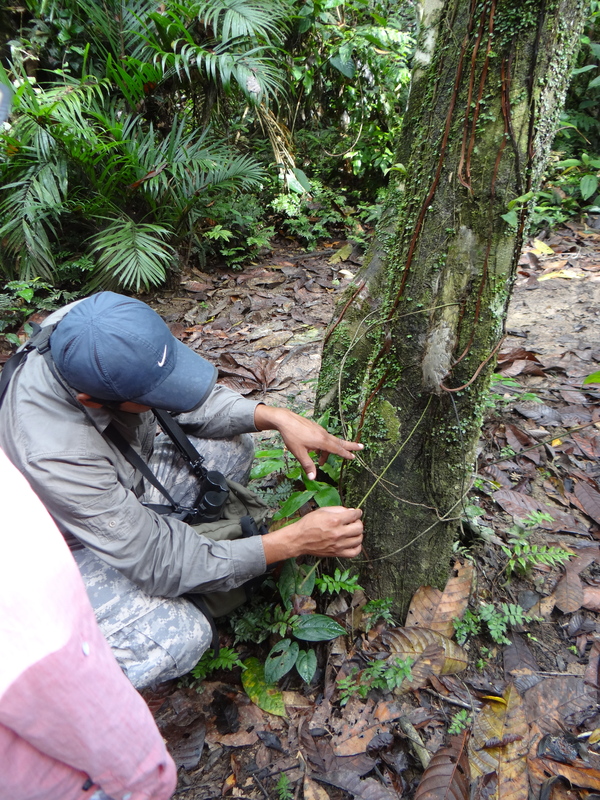 We learned about a few of the more than 20,000 plant species that occur in the rainforests of southeastern Peru. 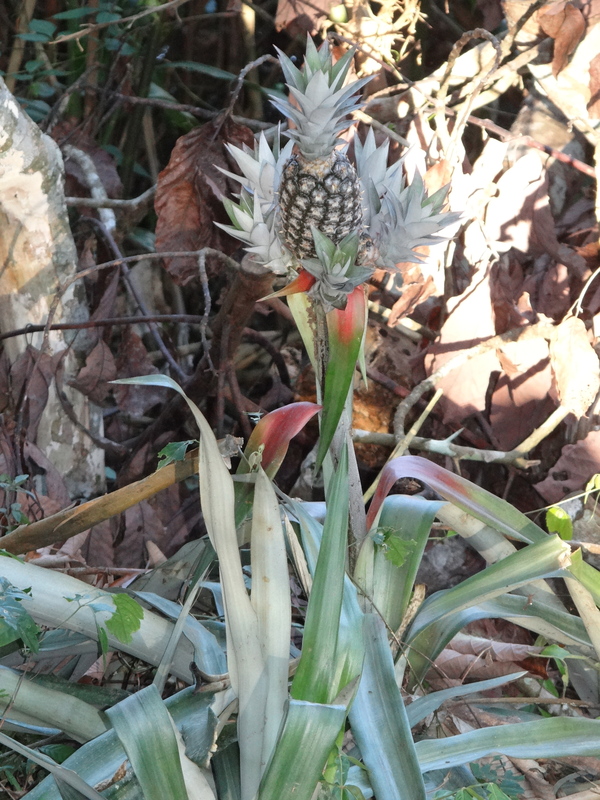 Many are used by locals for medicinal purposes, art, cermonies or food. We found these great leaves that when crushed gave off a great red coloring used by many for decorative things. We saw many termite mounds including those built on tree trunks. 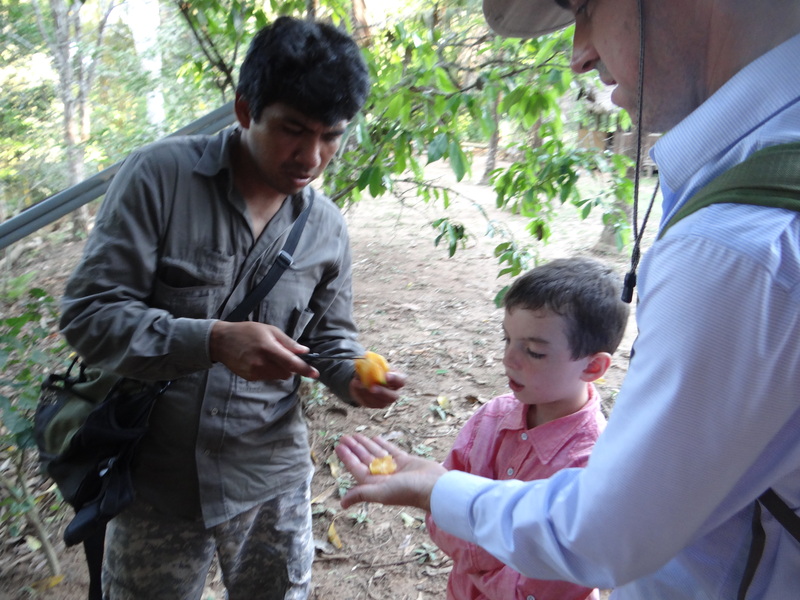 Carlos explained that locals like to eat termites so John, Madie and Jack were brave enough to try them. So many interesting animals. Nowhere else on the planet exists a forest that has more than 600 species of birds, well over 100 species of mammals and more than 100 species of reptiles and amphibians. 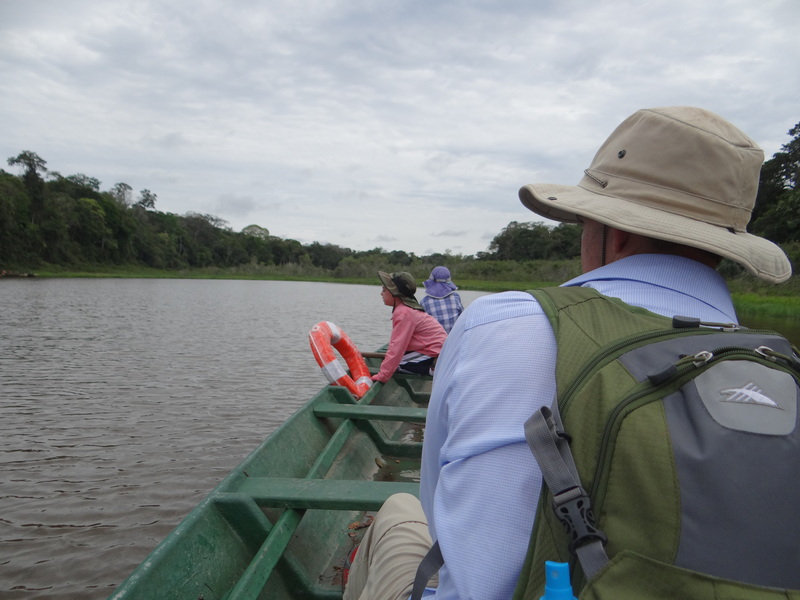 When we reached the Oxbow lake we boarded a small kayak to explore. This Oxbow lake formed when a bend in the river got cut off from its main channel. The lake is very quiet and tranquil creating a habitat for marsh grasses and many interesting animals that live in these backwater lagoons. 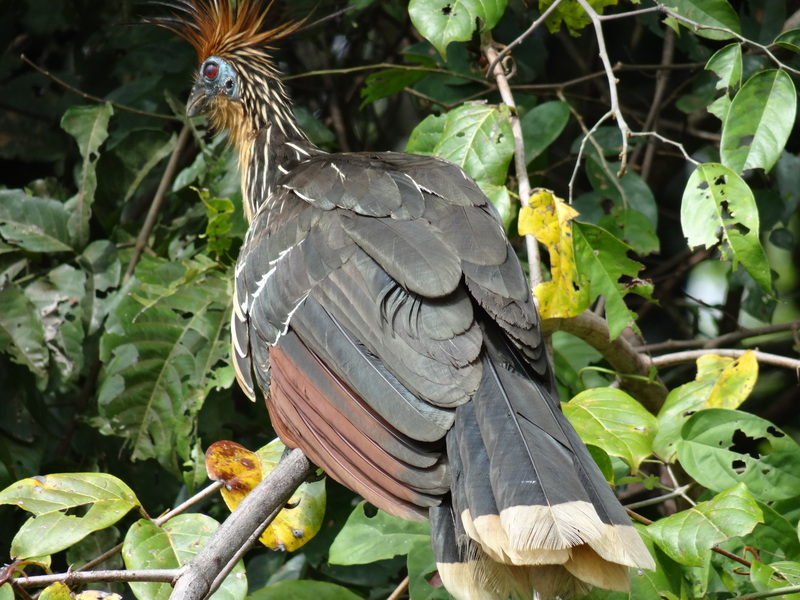 First off was the Hoatzin, a bird that is a cross between a pheasant and a feathered dinosaur, they live right around the edge of the water and make odd grunting noises. The locals call it a “Stink bird” because of the bad odor it gives off. 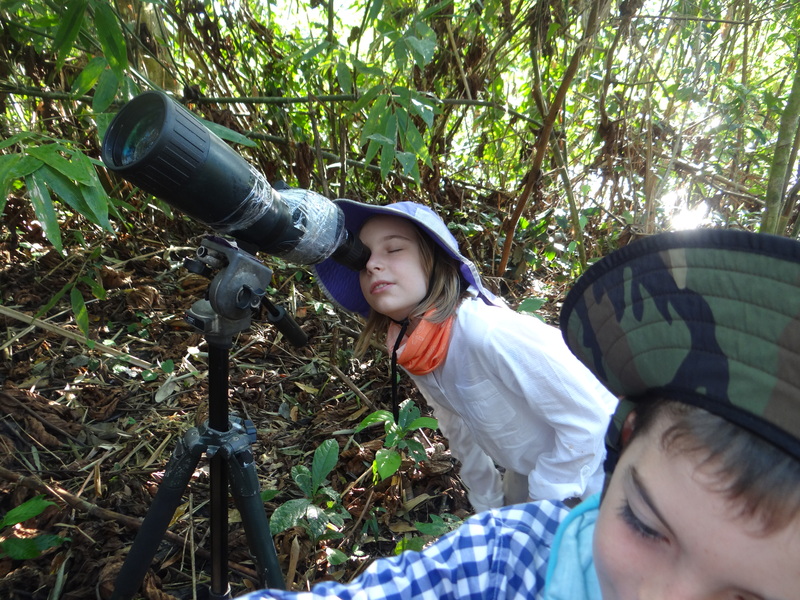 We were on the lookout for Black Caimans and giant Anacondas. Thankfully we didn’t come across either that day. 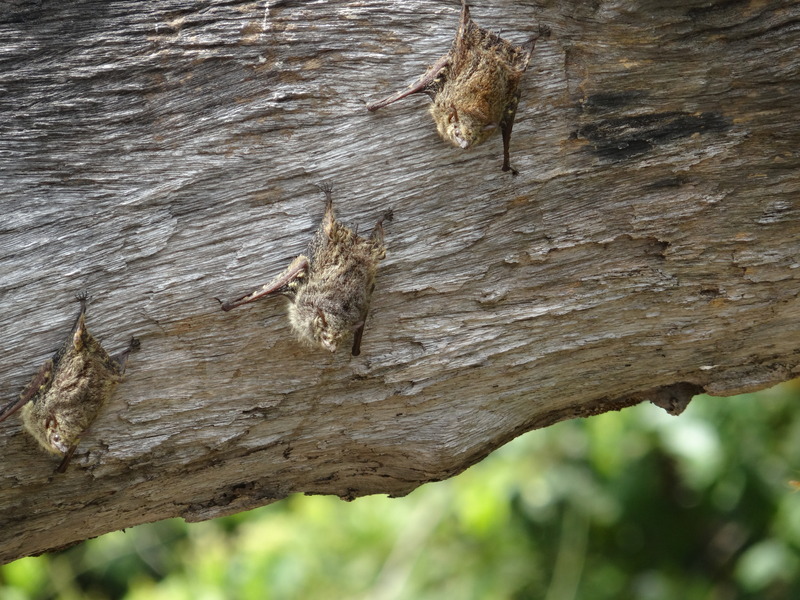 We did find a family of bats that were sleeping on the underside of a tree log. 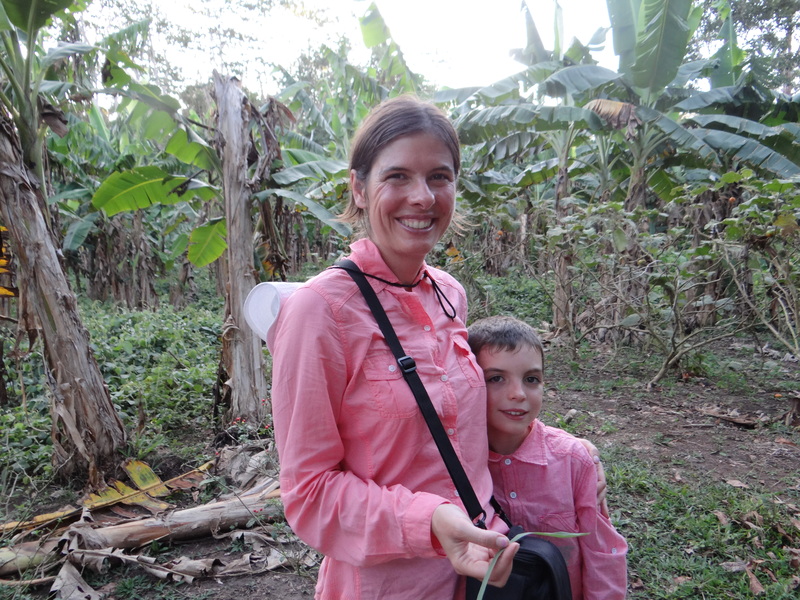 We also saw amazing dragonflies. 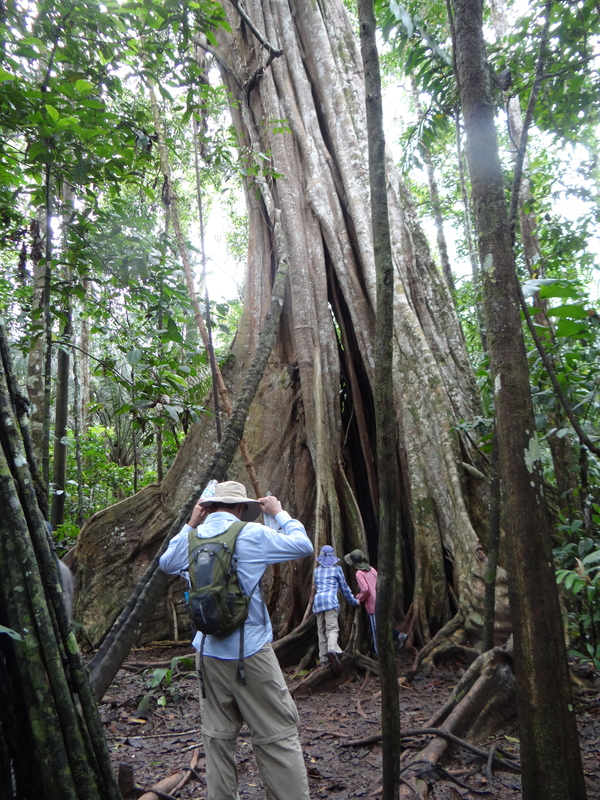 As we parked out boat on the other side of the river we ventured out to see one of the largest trees in the rainforest – the Kapok. 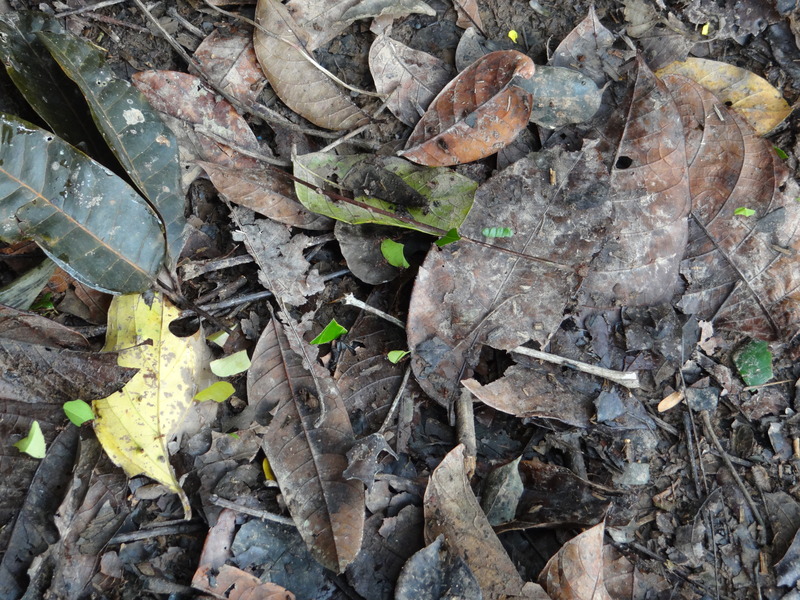 Finally as we got back to the other side of the river we came across a group of leafcutter ants. We watched as this incredibly long procession of ants, each carrying a small cut of leaf, walked diligently quite a distance to their nest. We learned that they don’t use the leaves for food but instead, they chew up the leaves, spit them out and eat the fungus that grows. Almost every insect or animal had an fascinating story. Since most of the activities would begin very early in the morning, we would arrive back at the main lodge an hour or two before lunch and have the chance to relax. After lunch we took a boat across the Tambopata River to explore a working local farm which grows a huge variety of fruits and vegetables. 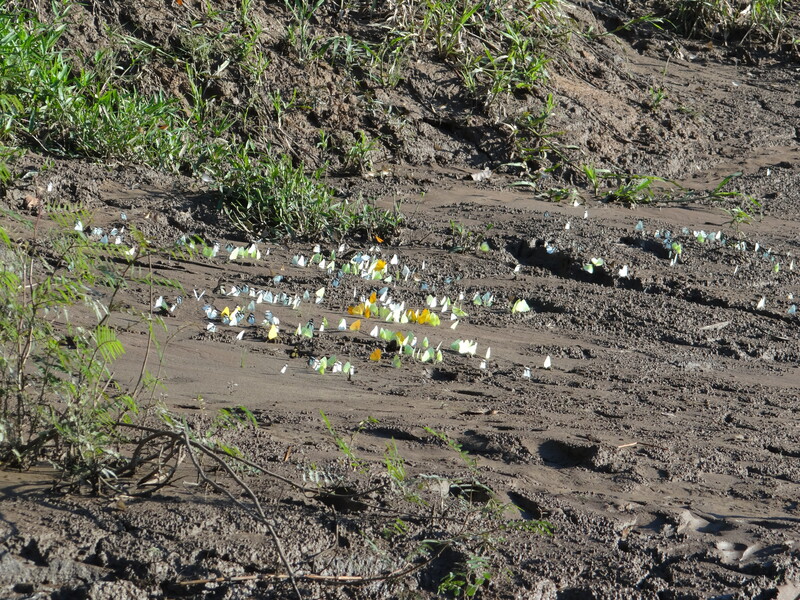 On the way to the farm we came across what appeared to be a butterfly clay lick. 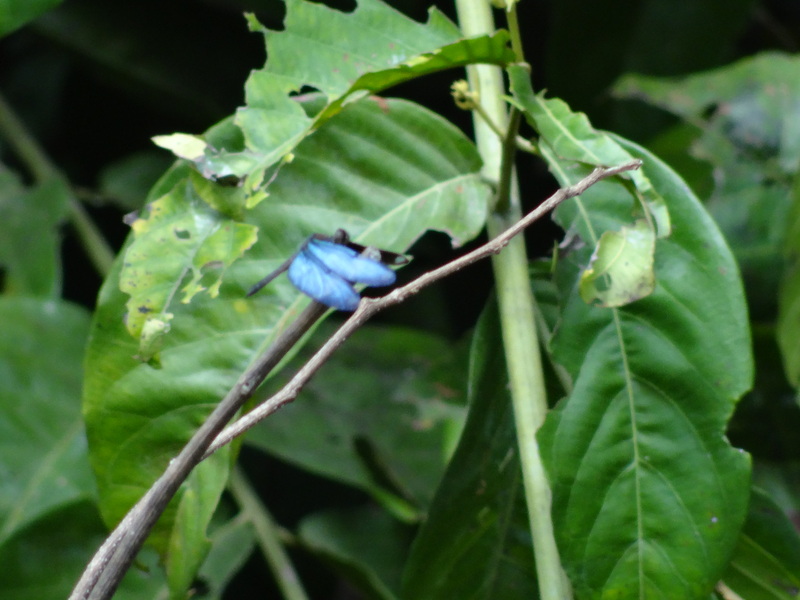 There are more than 1000 species of butterflies in the rainforest of Tambopata. The owner of the farm showed us all the crops he manages including so many things we had never heard of. 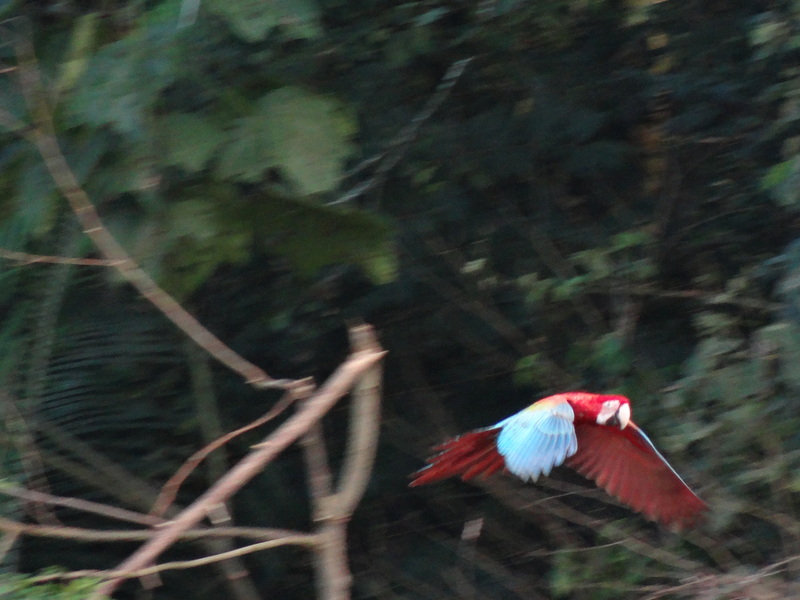 We also saw monkeys and heard macaws fly overhead. 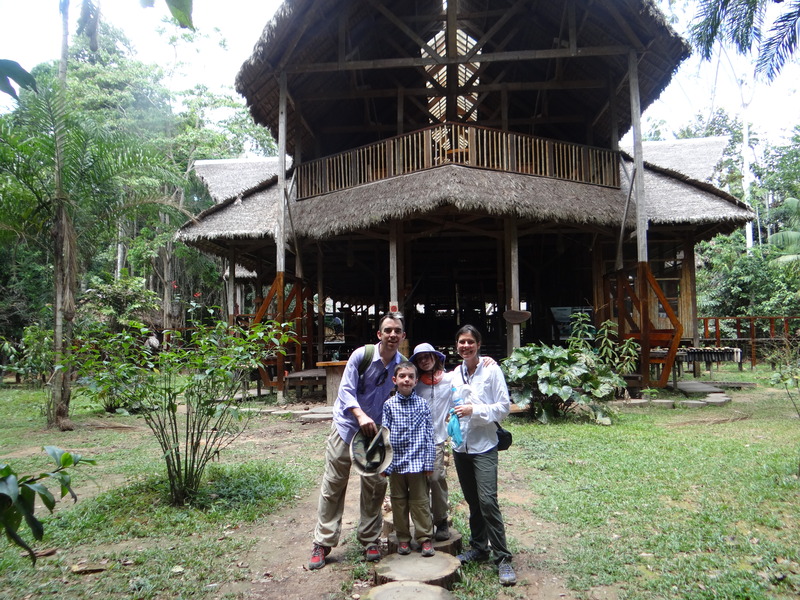 Each night we would gather in the main lodge and eat dinner with our guide. This was not your typical hotel buffet. The food was very simple peruvian food as if you were a guest in someone’s home. Since I don’t eat meat, I had a very strange version of tofu patty dressed in a different sauce each night. Kids didn’t see anything they recognized at any meal. The second day we woke up early and headed to the macaw clay lick. 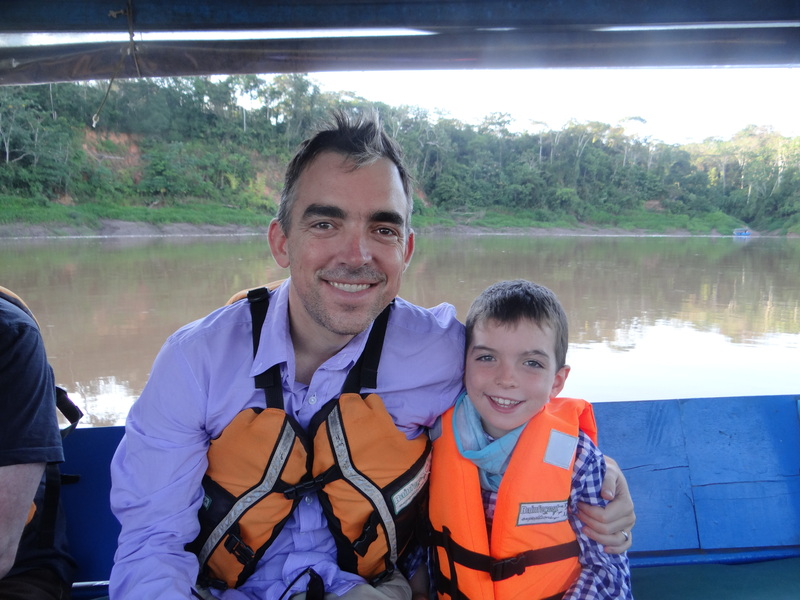 We took a short boat ride followed by an hour-long hike through the rainforest to a clay lick for macaws. A few miles up stream we saw what looked like a White Heron but looking closely he had this vibrant blue head and baby blue beak. 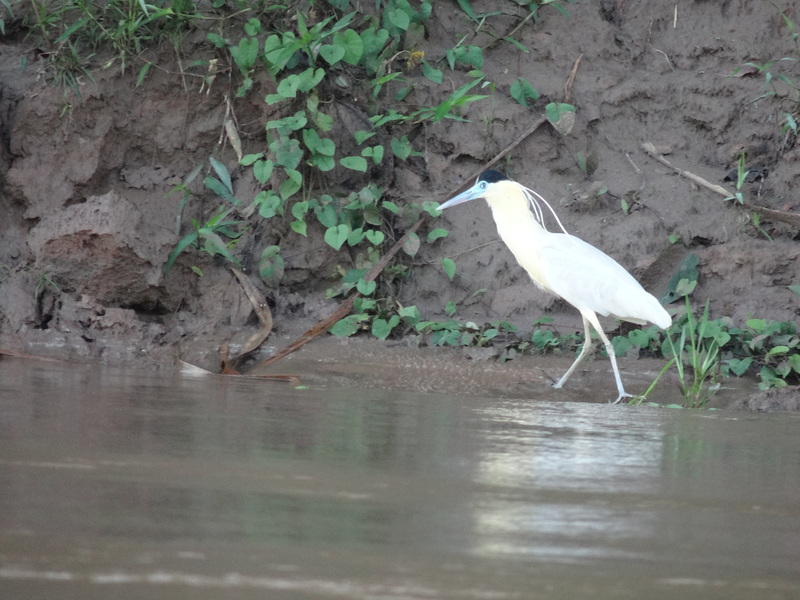 He is the Capped Heron. 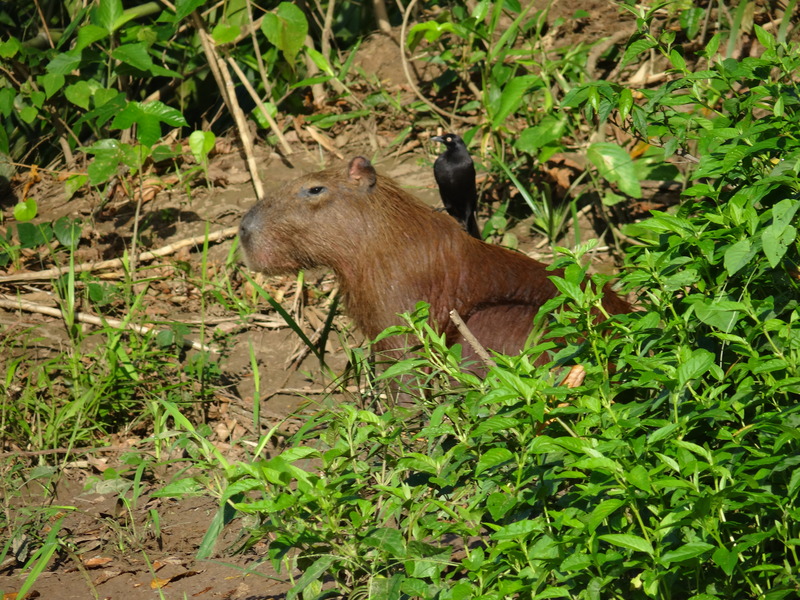 When we got to the area of the river bank where we would start our hour-long hike through the jungle, we were greeted by a Capibara which is the world’s largest rodent weighing as much as 100 pounds. 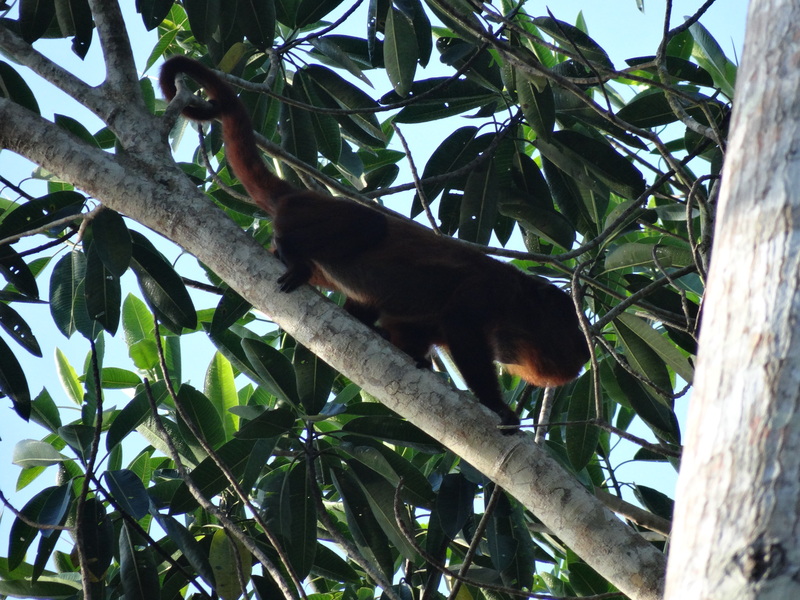 After just a few minutes of walking our guide spotted a red howler monkey sleeping in a tree. 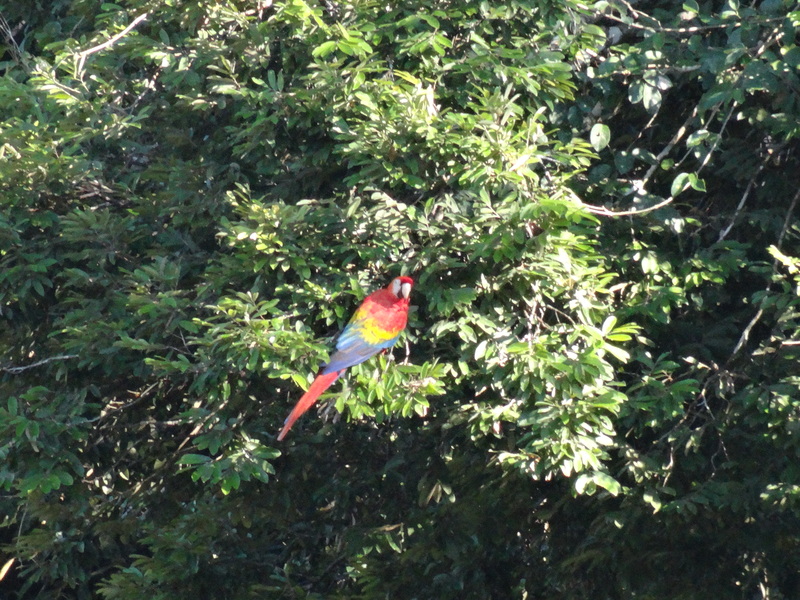 We watched him for a while until he moved on in the tree canopy. Just a few steps later our guide spotted a Tarantula nest. The guide had us gather around this large hole that looked like a giant burrow bigger than a rabbit. 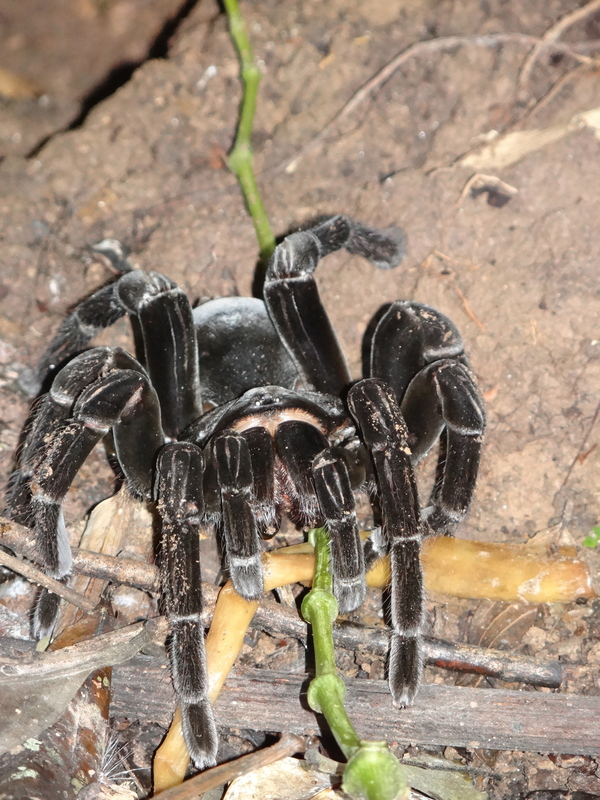 It was home to the second largest spider in the world – Araña Pollito – or chicken spider. As we all stood around this giant burrow, we were told to be very still and completely quiet since the spider can sense vibrations. Our guide took a tree branch and slowly moved it into the hole. As he pulled it back out, this giant spider the size of a dinner plate followed. Knowing we had to remain perfectly quiet, I put my hand over Madie’s mouth because I knew she was going to scream. As I looked over I saw tears coming down her cheeks. 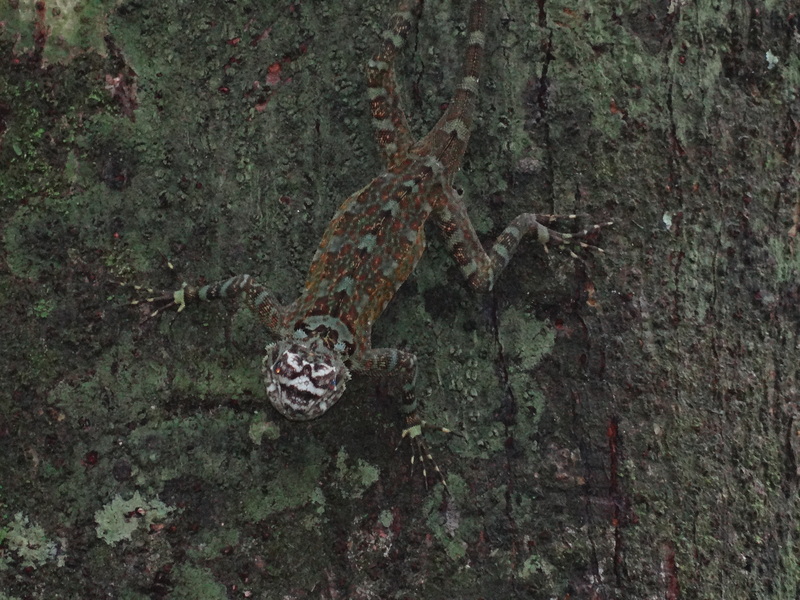 It was the most insane animal I have ever seen in the wild by far. I’m just sorry our photos don’t provide any perspective on how big he actually was. 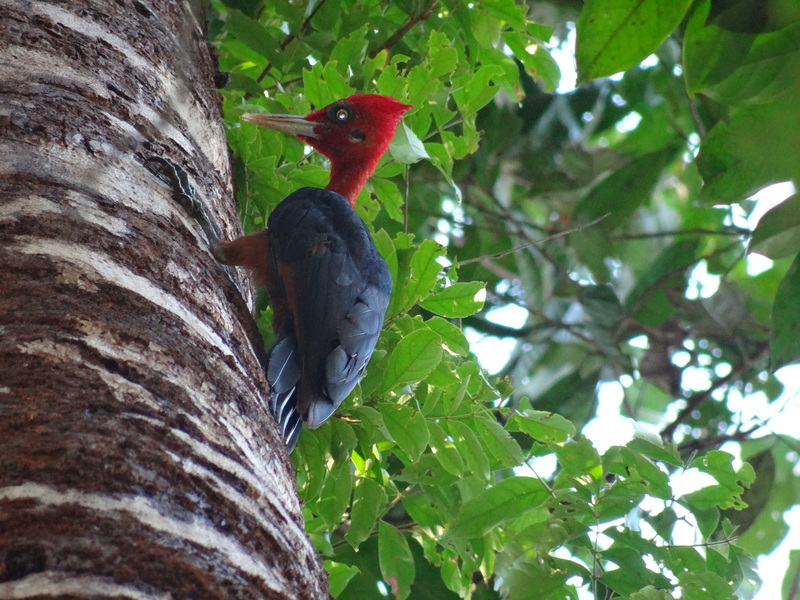 Here was a red-necked woodpecker. When we finally made it to the Macaw clay lick we were asked to stay behind a covered grass hut that had small holes poked out where you could view the clay lick. 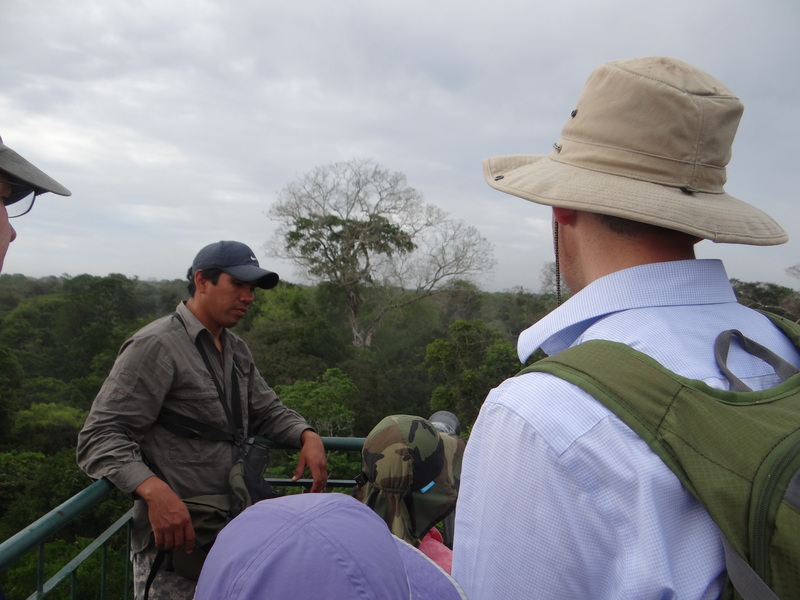 We were so fortunate because our guide says it is very difficult to know if the Macaws will visit one day or not. We saw more that we could count. It was amazing. We sat and watched them for an hour and then slowly they started to fly away in pairs (Macaws mate for life) or small groups until all the birds had left the Clay Lick. 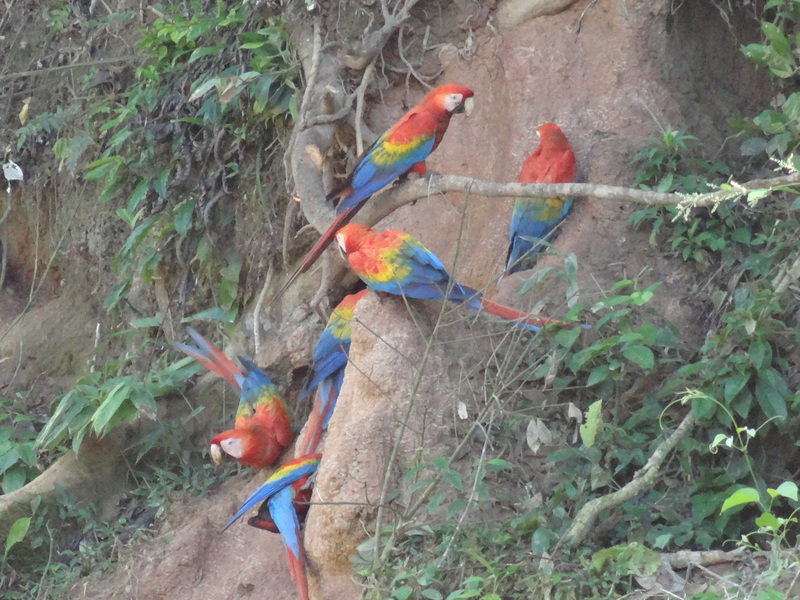 I found this great video someone produced about the Macaws in the Tambopata National Reserve. 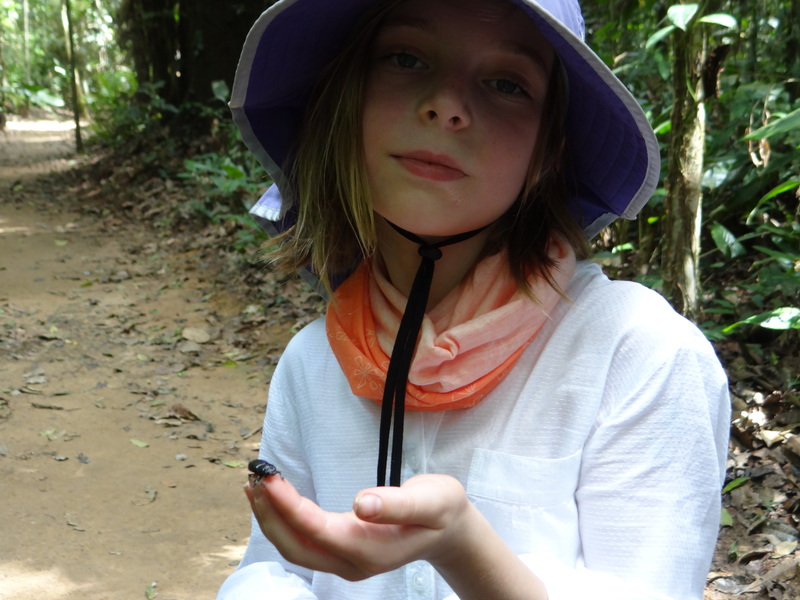 As we made our way back to the boat we came across many smaller creatures including this crying beetle, which gets its name because it makes a high-pitched whiny cry when it is disturbed. 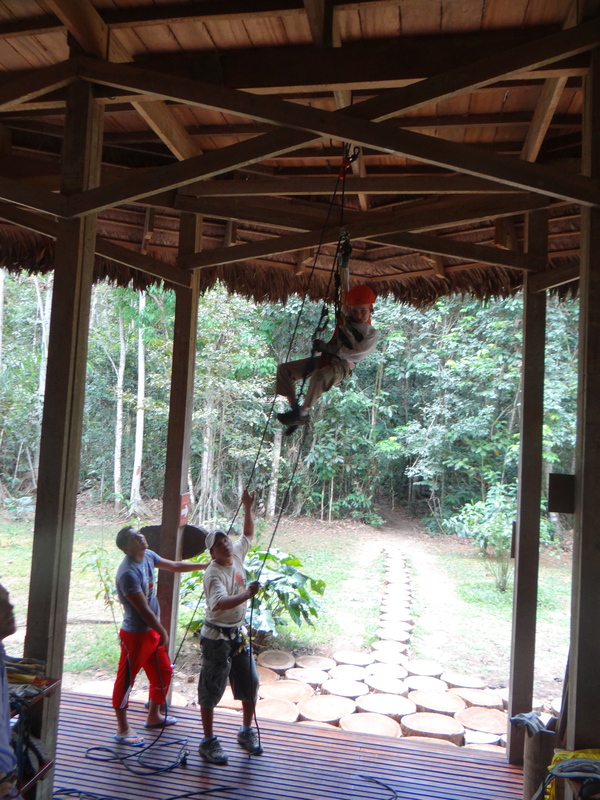 On our last afternoon we decided to do a canopy climb. 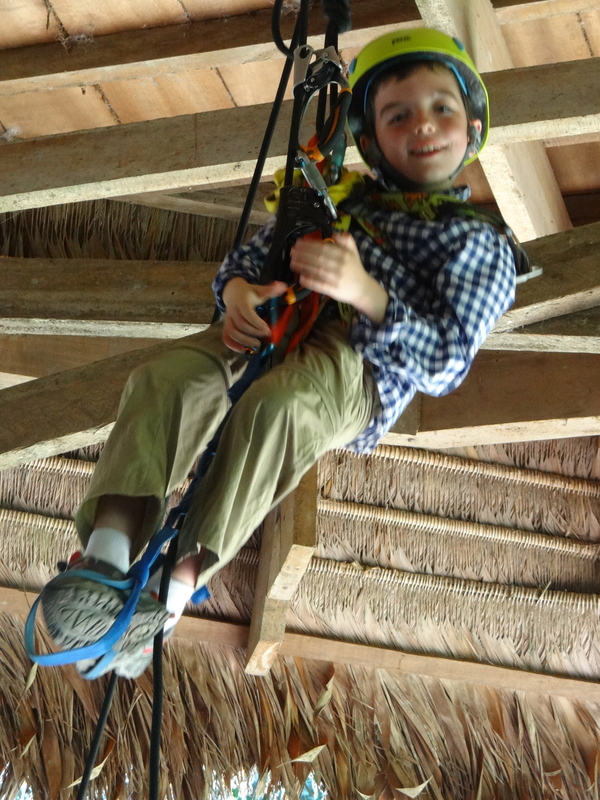 We were thinking it would be a zipline experience through the tree canopy. 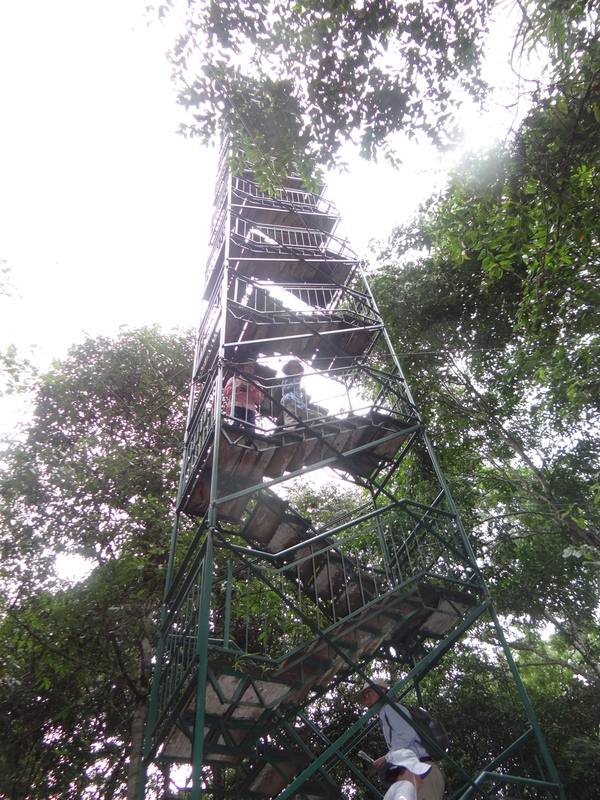 We discovered when we went to the training that we would have to lift ourselves 30 meters up to reach a high platform above the tree canopy. We thought Madie could probably do it but we were not at all sure about the rest of us. 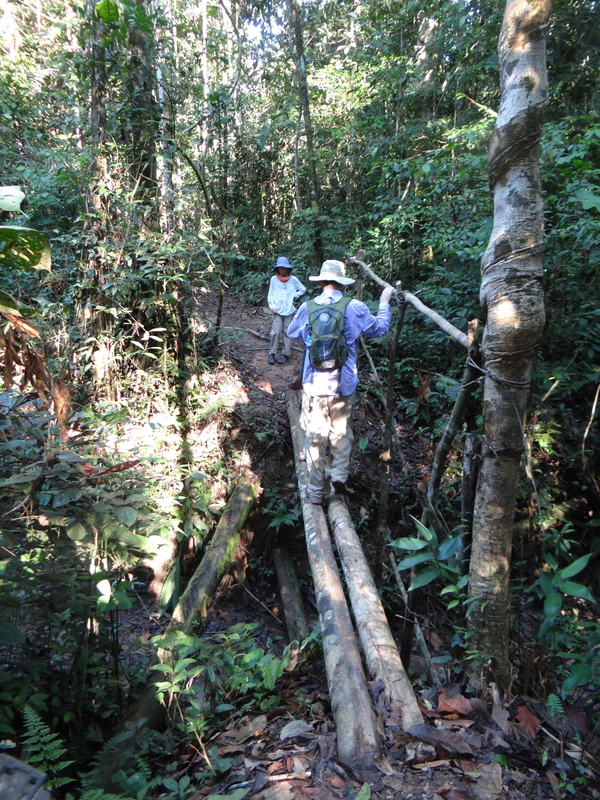 It was incredibly tough but all of us reached the top just in time to see the sun set over the Tambopata River. 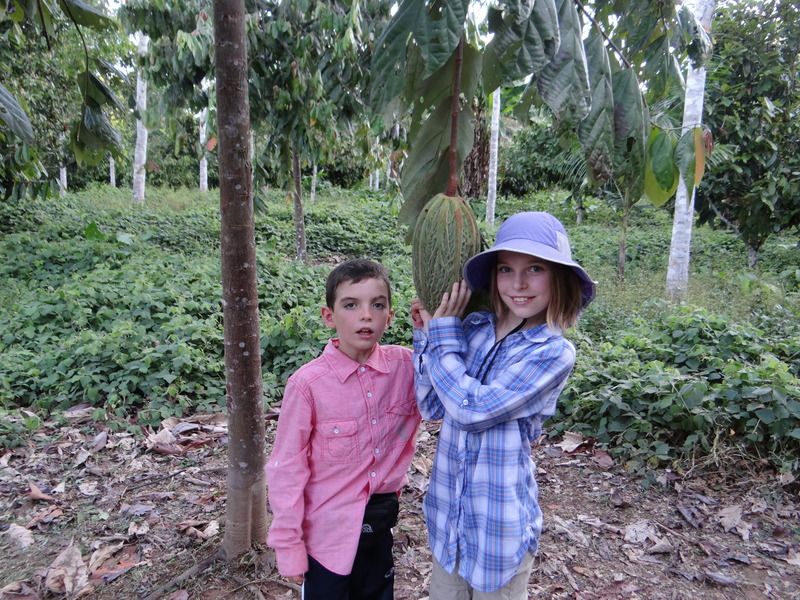 John and the kids also saw a toucan land on the adjacent tree. Super cool. I would recommend being very clear on what you are signing up for. 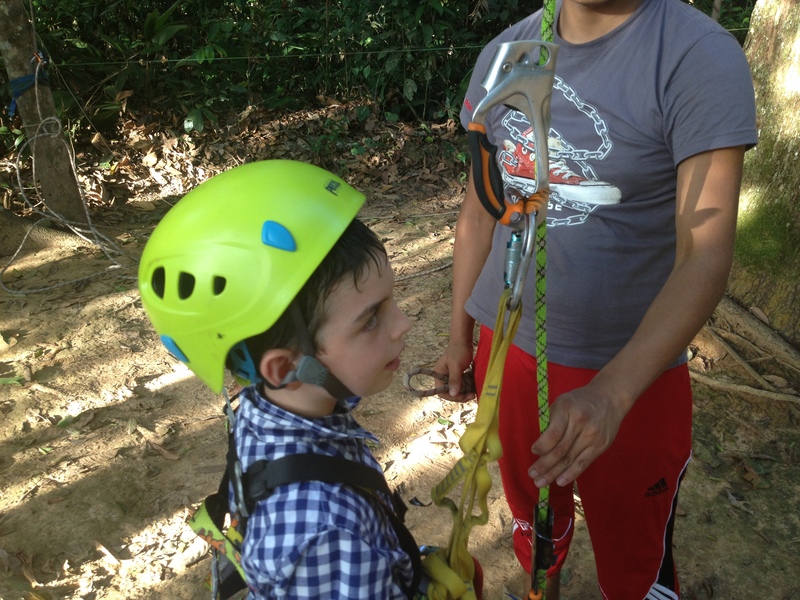 Zipline is a bit different than physically pulling yourself up 30 meters. 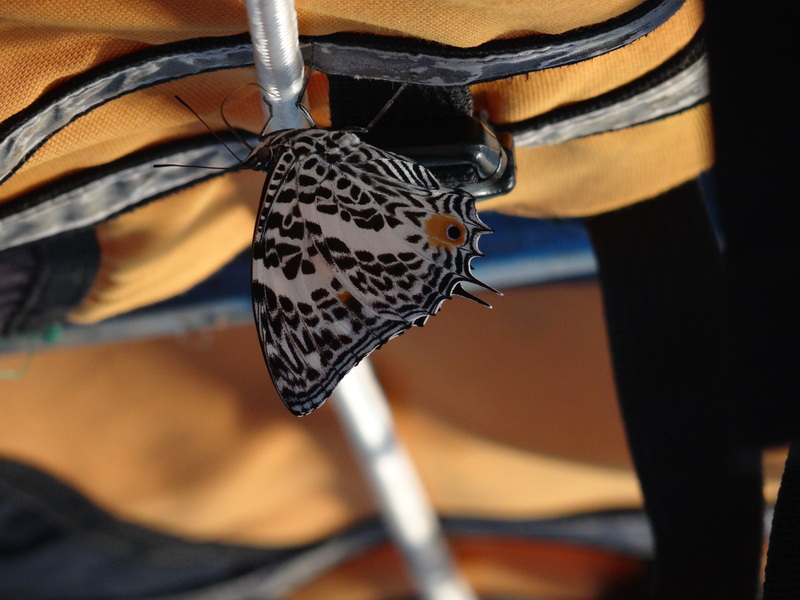 We ended the day with a trip to spot Caymans in the pitch darkness of night in a canoe. We saw a White Caiman and Spectacled Caiman on the river banks that quickly found the water as we approached. Our photos don’t do it justice. It was amazing being on the water at night. We also took a night hike to discover the nocturnal animals. 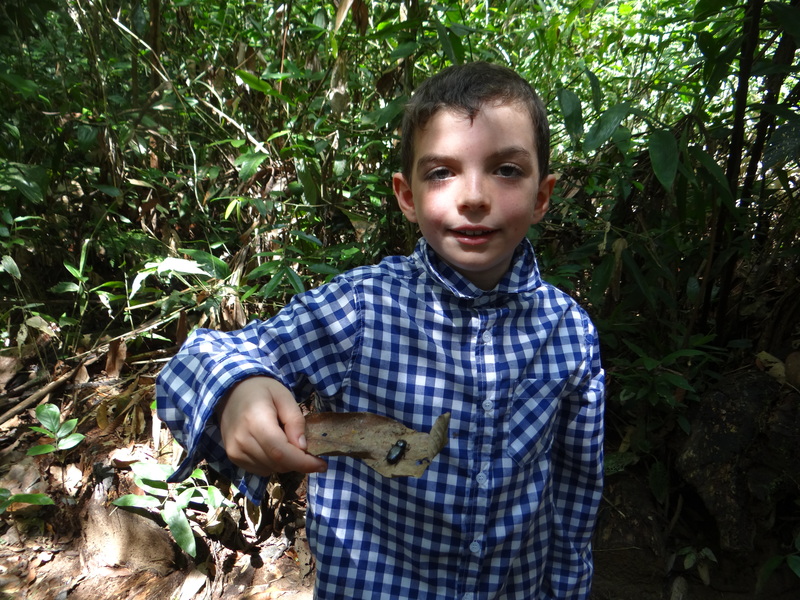 We saw two snakes: a Whip Snake and a Blunt-headed tree snake, the Amazon Pigmy Owl, White-throated Ant Bird, Tailless Scorpian, Sheep Frog, Cane Toad and glow worms. And, after the kids went to bed, John and I headed to the main lodge to have a beer and the generator went out so we sat in the dark with candles while the bats flew around us. It is not for the faint of heart. I have to say this was one of the most incredible adventures we have had. 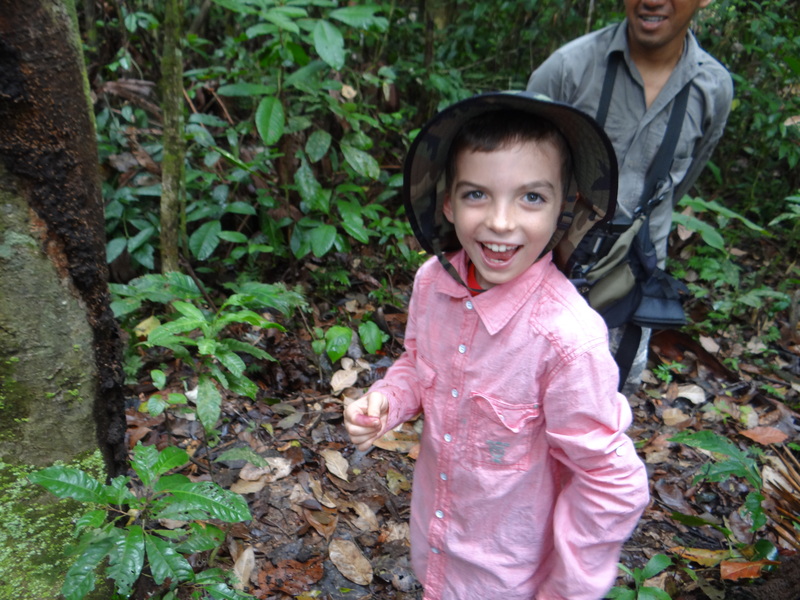 Rainforest Expeditions was amazing. It was incredible to be totally off the grid for 4 days exploring such a remote part of the world. 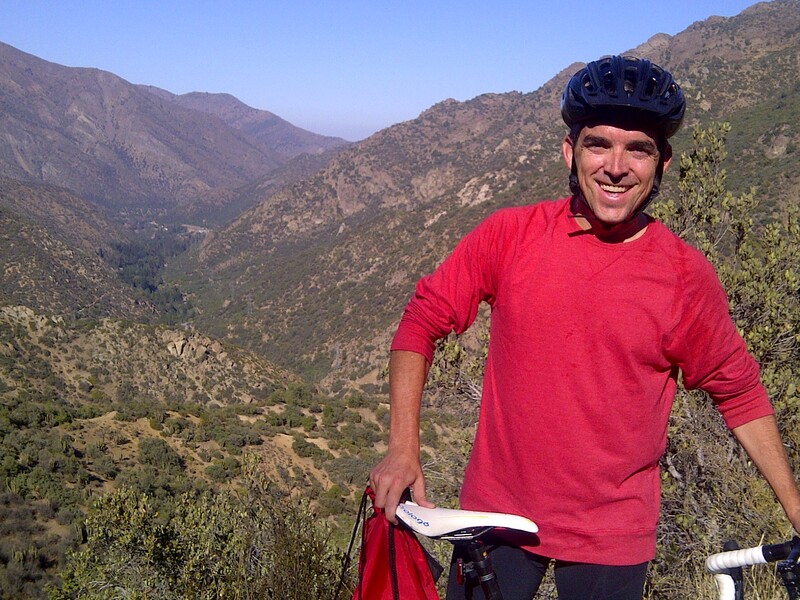 On Saturdays, John has started road biking on Farrellones which is the road that leads up to the ski resorts not far from our house. Outdoor activities abound here and cycling is a big one. He recently purchased a new bike in New York City on a layover (Bikes are SO expensive in Chile) and has found two work colleagues who are serious cyclers and have given him great guidance. He is big time now – even has the shoes that snap in and the bike pants with the padding. The big thing here is to cycle up these incredible mountains. 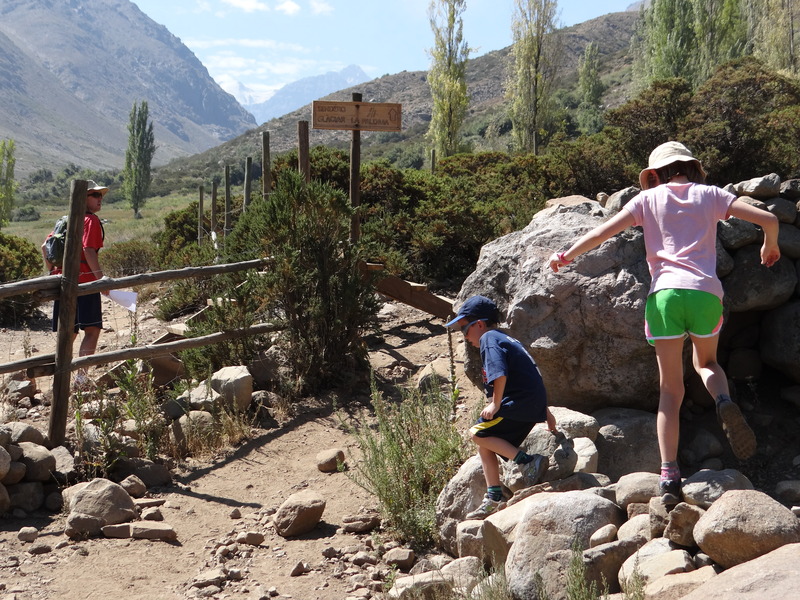 Cycling up Farrellones starts with a 16km ride that rises about 1500m and then there is a second phase with 40 numbered switchbacks to the Valle Nevado Ski Resort which is about 45km from our house. The past few weeks they have made it to turn 15 – in total about 24 kilometers and a 2500 meter climb. 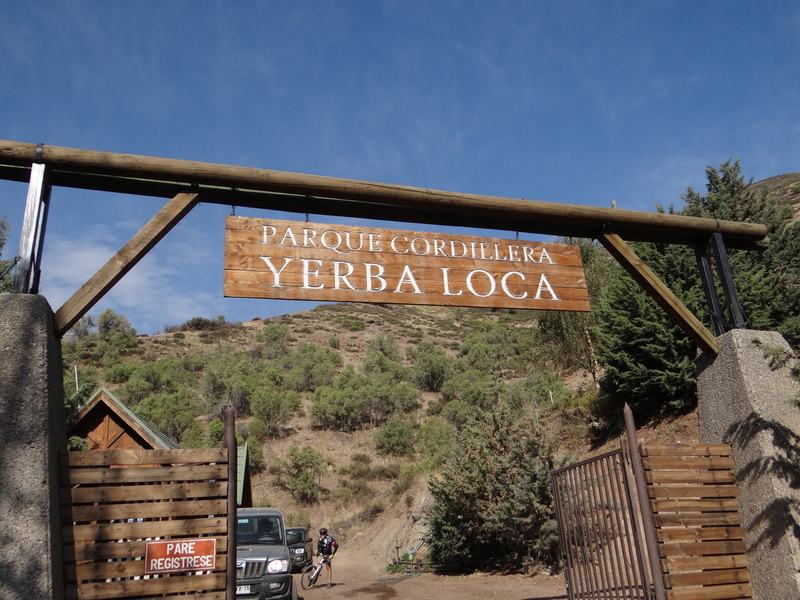 There is an incredible park at “turn 15” called Parque Cordillera Yerba Loca. We thought it would be fun for us to see John’s crazy bike route while finding an extraordinary place to Hike. 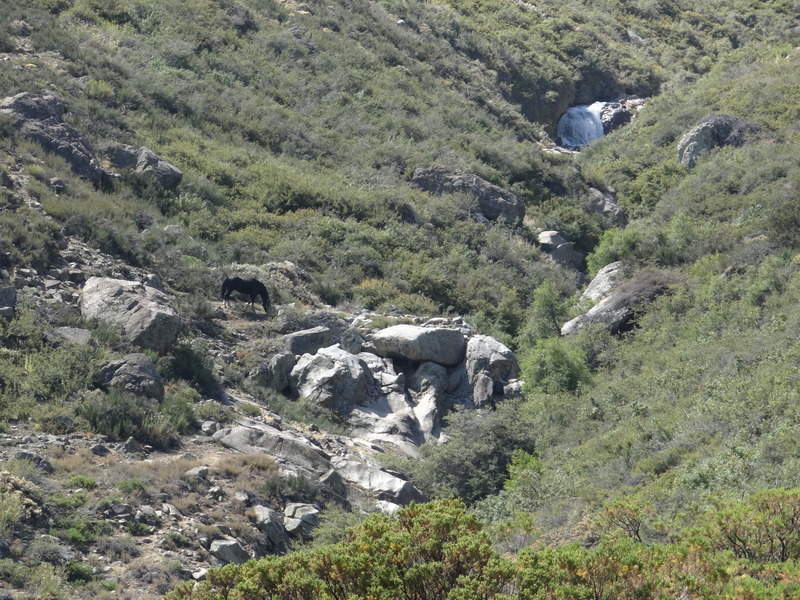 So on Sunday, we made the drive up and went for a hike with the kids. We ended up going only 1 hour out and coming back because we got such a late start but it was spectacular. I’ve posted below a bunch of photos from the hike. It was great for the kids because there were cows around every turn and horses off in the distance. 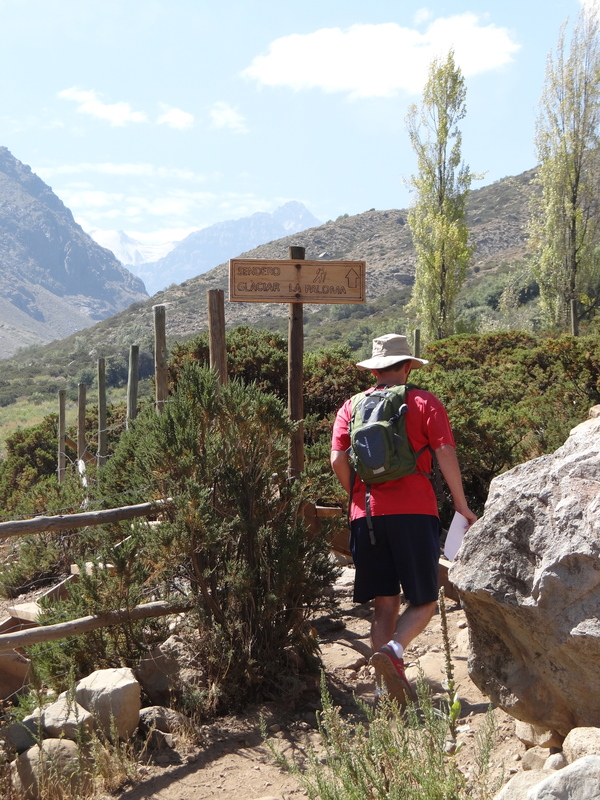 Parque Cordillera Yerba Loca has a hike to a Glacair La Paloma where you hike for 19.24 kilometers (about 9 hours they suggest) and you get to the foot of this remarkable Glacier. 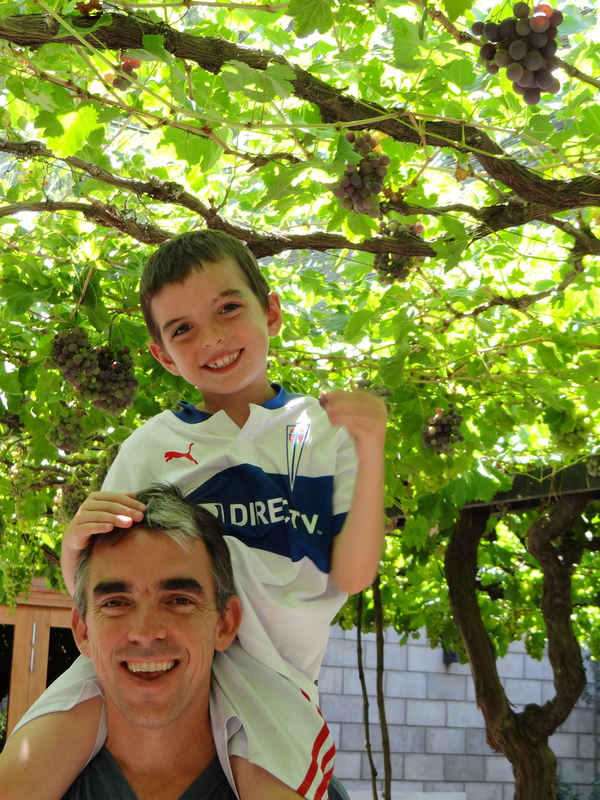 John and I have decided we need to do it before we leave Chile. They also have a hike in the winter that takes you to a giant frozen waterfall where you can go ice climbing. People say it is the best place in South America for ice climbing. Not sure we will try that one. 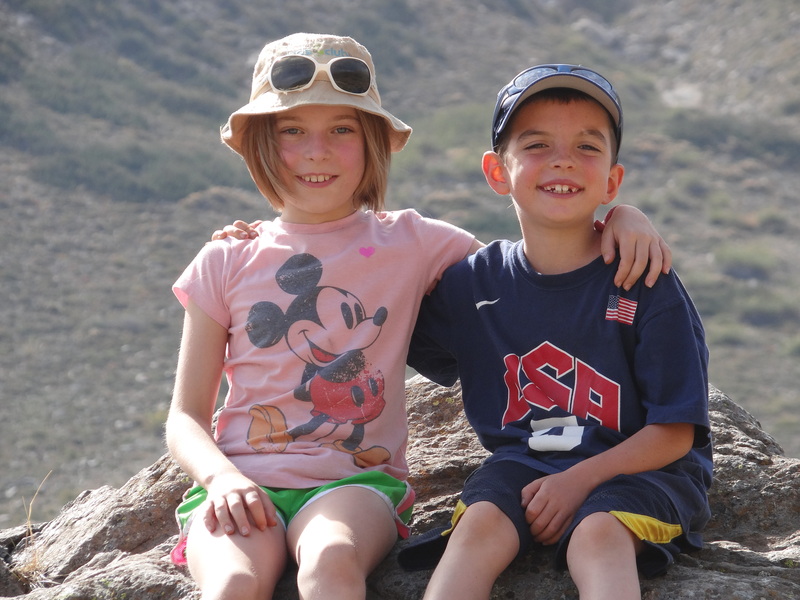 The kids are always incredibly proud at the end of a hike. We are all going to be outdoor adventure sports enthusiasts before we leave. 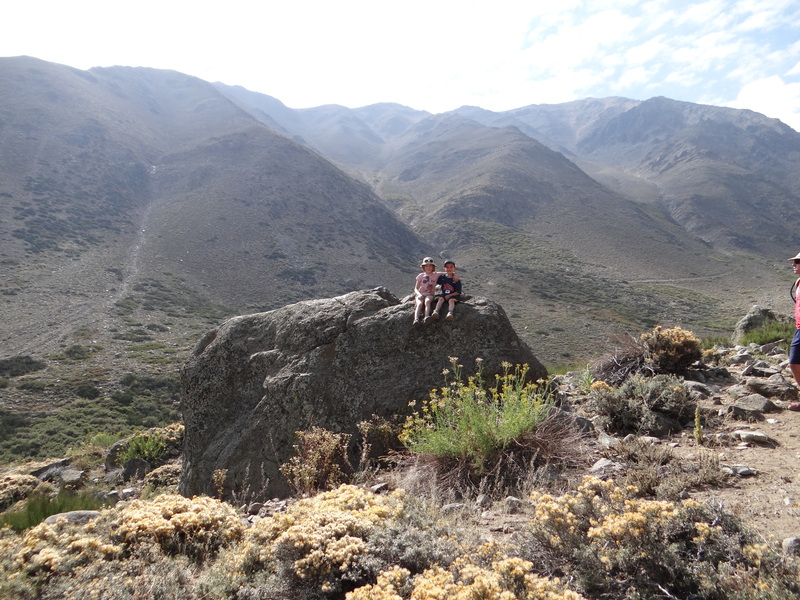 The topography of Santiago is so amazing that it is hard to believe this hike was just a random Sunday outing. 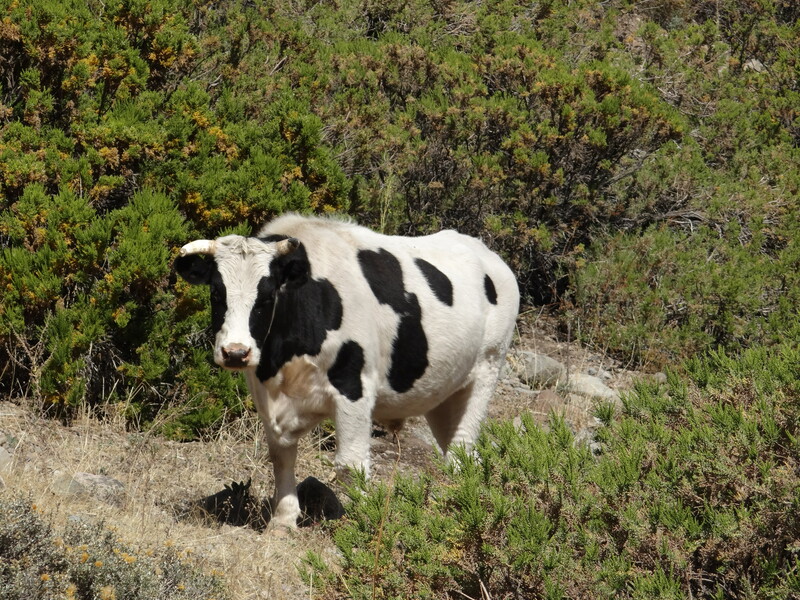 Some people warned us that Chile was not known for its cuisine. 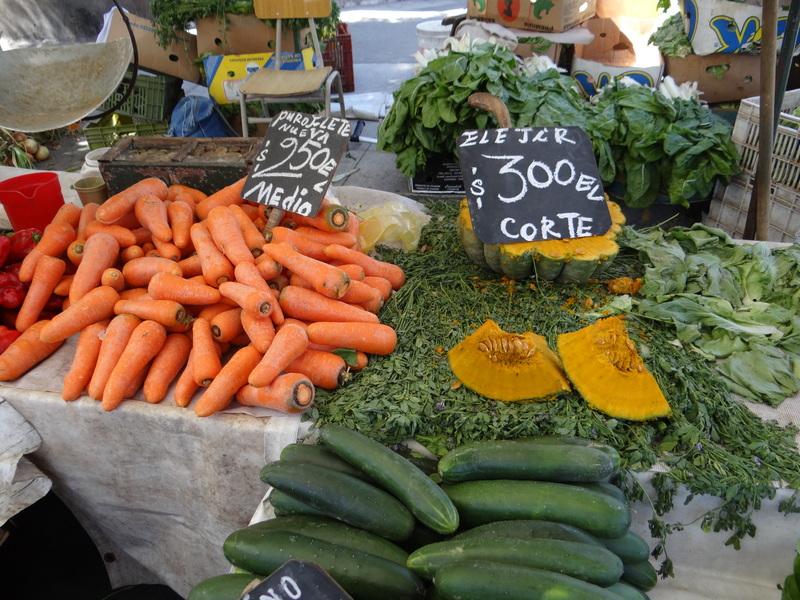 That never bothered me because I love to cook and I assumed that since the US imports much of its fruit and vegetables from Chile, I would have plenty of spectacular raw ingredients. Not a big deal if we didn’t eat out as much. When we came to visit before moving, we visited a grocery store to get a sense for food in Chile. On the surface, nothing felt all that different. The supermarket felt like any US suburban grocery store with a larger variety of sausages and no Kraft Macaroni and Cheese. My first real grocery shopping trip surprised me. The first time I had to gather specific items into a cart, I got overwhelmed and went home. Really. This is not typical for me. I love grocery stores. On my second visit, I came home with the most random assortment of things: hotdogs, oranges, and Diet Coke (which is sold by the single can and incredibly expensive). My third visit, I went to the store with a specific meal in mind thinking that would help. It didn’t. I couldn’t find half of the ingredients and those that I did find were twice the price I was used to paying in the US. For instnce, they don’t have Bacon. They have Procuitto, which I’ve now purchased four different brands in an attempt to replace bacon in the mornings. 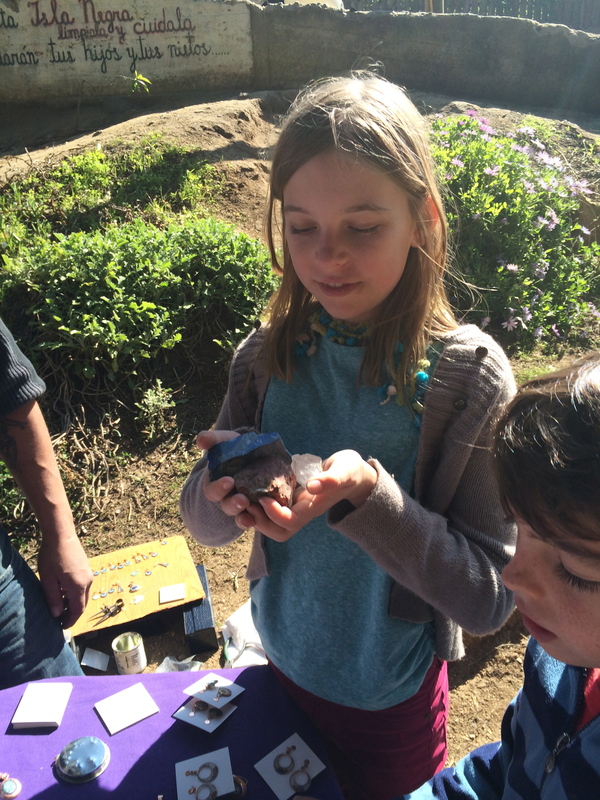 The kids stare at these small salty little bits of pork and wonder what it might be. American Cheese is something we had prepared to leave behind. But, isn’t American Cheese just a bland cheese that melts easily? Who knew those characteristics were so unique? Vanilla yogurt is another example of something we miss. 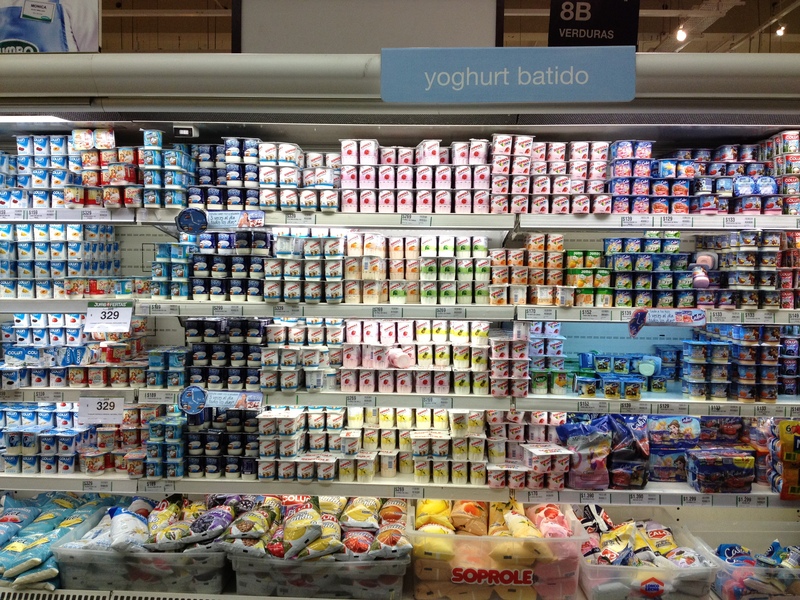 In Chile, there is an entire isle in the grocery store- both sides- dedicated to yogurt variations but there is no simple vanilla yogurt. And, I have my own issues. 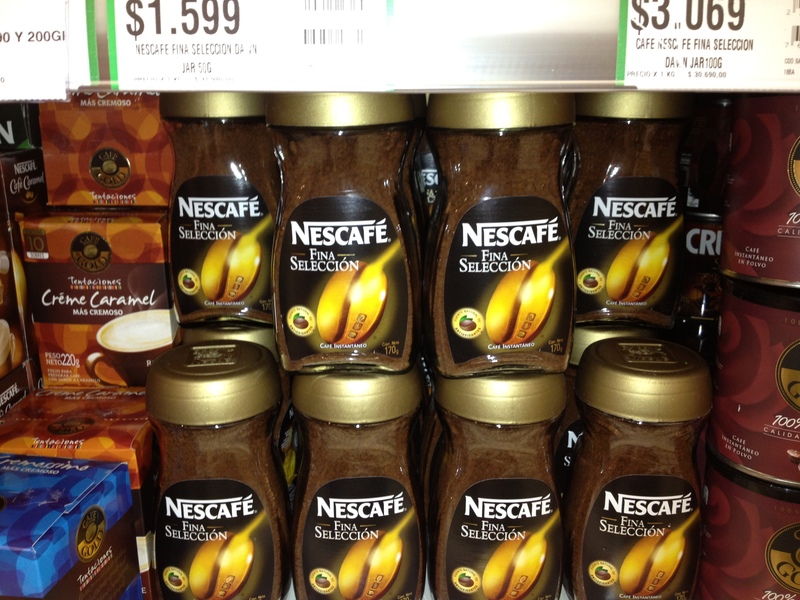 Chileans like instant coffee with warm milk. While I have found a somewhat decent brand of ground coffee (among an entire aisle of instant brands), Half-and-Half does not exist. In fact, they do not have any fresh milk of any kind. When I inquire about suggested alternatives for half-and-half specifically I get a lot of “condensed milk” suggestions or a powdered Nestle creamer. They do have something called Crema, which I went to first, but John describes it as ice cream for my coffee. I can only imagine how large I will get if I use this as an alternative. My latest attempt is to take a milk container and mix the crema with milk. I will continue to work on the ratios. My other assumption, the raw ingredients piece, was wrong as well. Turns out that they export all the best fruits and vegetables to the US completely skipping grocery stores here. In Jumbo, the big supermarket (which really resembles a Target in almost every way) there is one small special case in the fresh fruit and vegetable area where they keep a small offering of high-quality fruit that is exported. You have to seek help from the person behind the counter and the additional cost is unbelievable (a $10 bunch of grapes). You would honestly think I was seeking fresh french truffles. I have yet to find the organic free-range chicken. I think they would simply stare at me if I asked where I might find that in the supermarket. 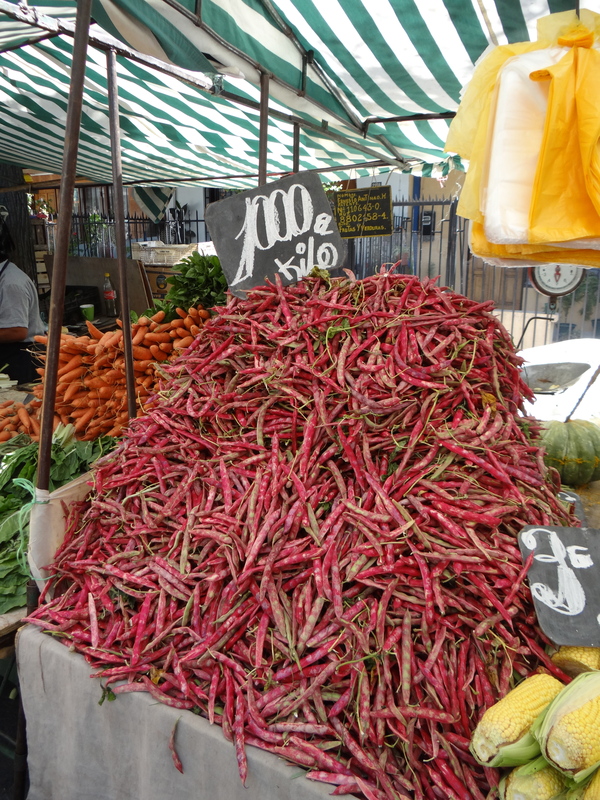 They do not have any market for organic foods here – let alone organic meat or chicken. In fact, the chicken all comes “con marinado” or with a salt marinade. It couldn’t possibly be less healthy. The country that gave us Chilean Sea Bass doesn’t eat a lot of seafood that we would recognize. 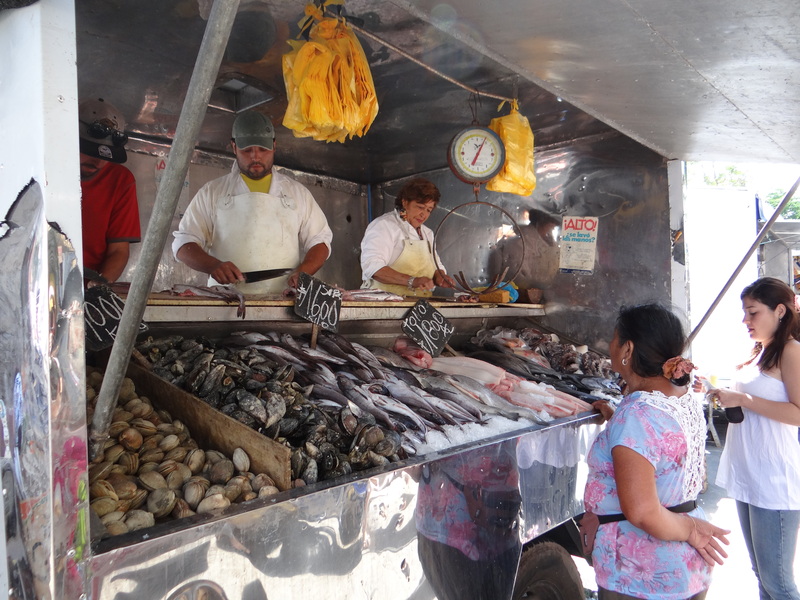 At Mercado Central, which is the fresh fish market in downtown Santiago, always noted as one of the top food markets in the world, has hundreds of stalls offering fresh seafood of all kinds but it is incredibly difficult to navigate. 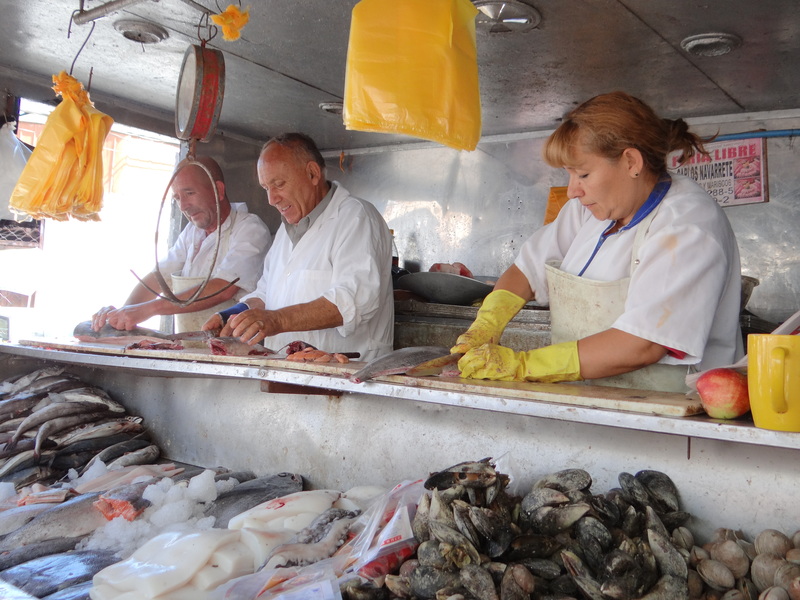 Often, we have purchased seafood only to realize it has gone bad when we get it home. They carry lots of odd crustaceans that I have no idea what to do with. I’m contemplating hiring a local chef to help guide me through the stalls to understand what I need to buy and from whom. I sound terribly negative and discouraged. Frankly, I am. I refuse to give up just yet, but I’m humbled for sure. I’m convinced that by mastering spanish I will unlock the key to the other more nuanced stores and markets rather than relying exclusively on the Target-like grocery store. 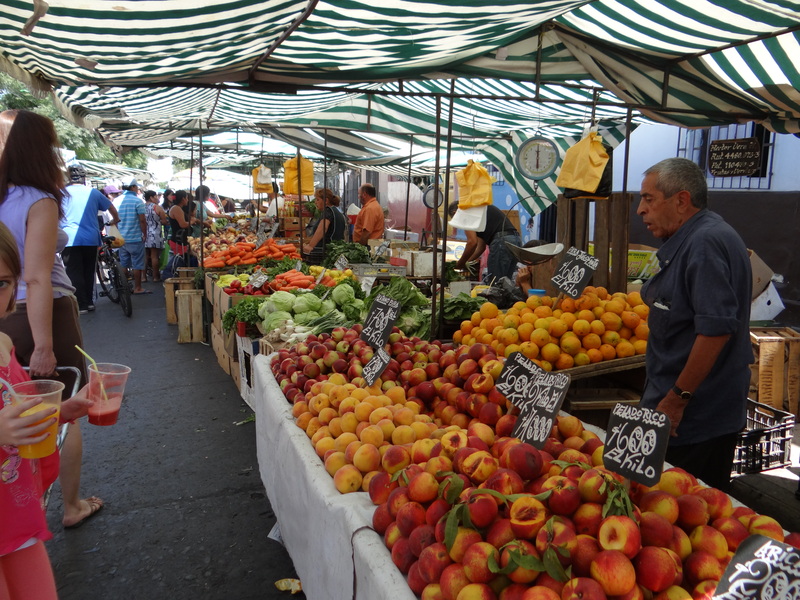 Now that it is summer, I’m also convinced that I need to stick with Ferias Libres or Farmers Markets for fresh fruit and vegetables. But, in the meantime, any visitor is required to bring a handful of items from the US. Or, if you know of any way to import French cheese….. Thank goodness there is so much good wine. This past weekend we made our very first road trip for a long weekend. 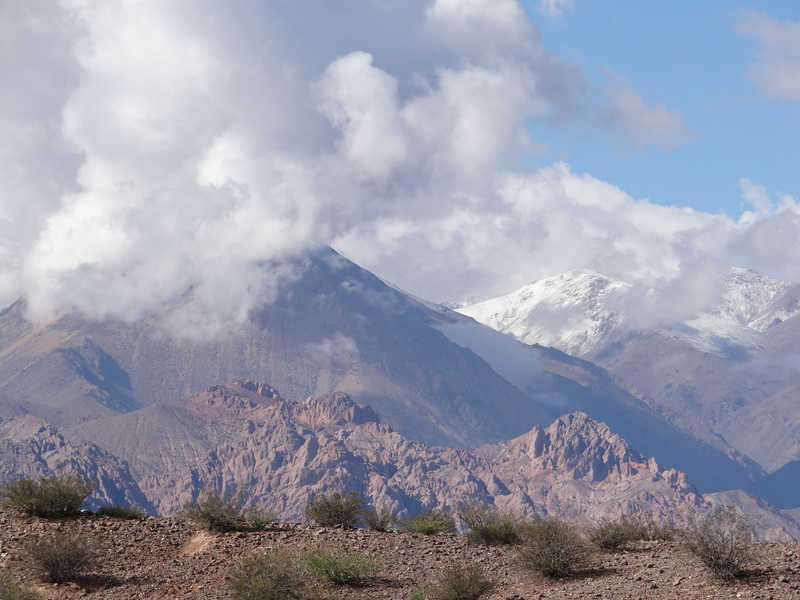 We had heard that Mendoza in Argentina was less than a 6 hour drive through the mountains from Santiago. 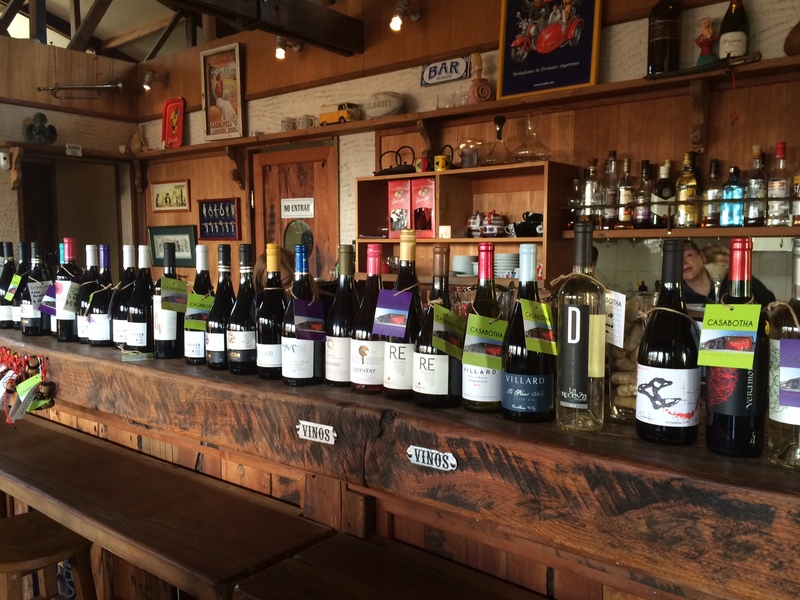 Imagine that, one of the most celebrated wine regions in the world was just a short drive away. 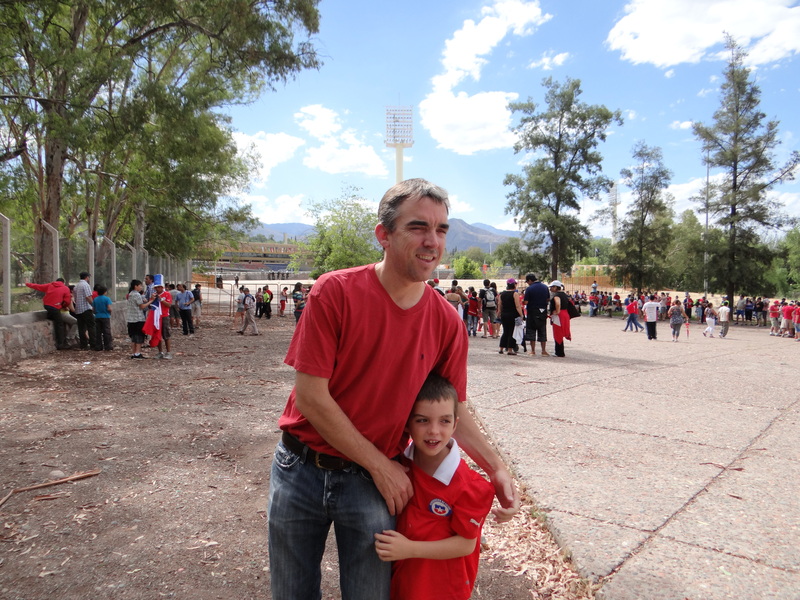 Combine that with the fact that the Sudamericano Sub20 Futbol Tournament, the tournament that will decide who plays in the Sub20 World Cup was being played in Mendoza (and Chile was playing incredibly well) and it became a perfect getaway for the Murnane family. We were planning to leave early Friday morning until we learned that due to some construction on the roads, the route only goes one way at the moment – departing from Chile to Argentina was only possible from 8 p.m. until 7 a.m. So we changed our plans to leave Thursday evening. The drive to the boarder crossing was about 3 hours from Santiago, so as we left our house at 6 p.m. we figured we would time things perfectly, just after the initial rush cleared. 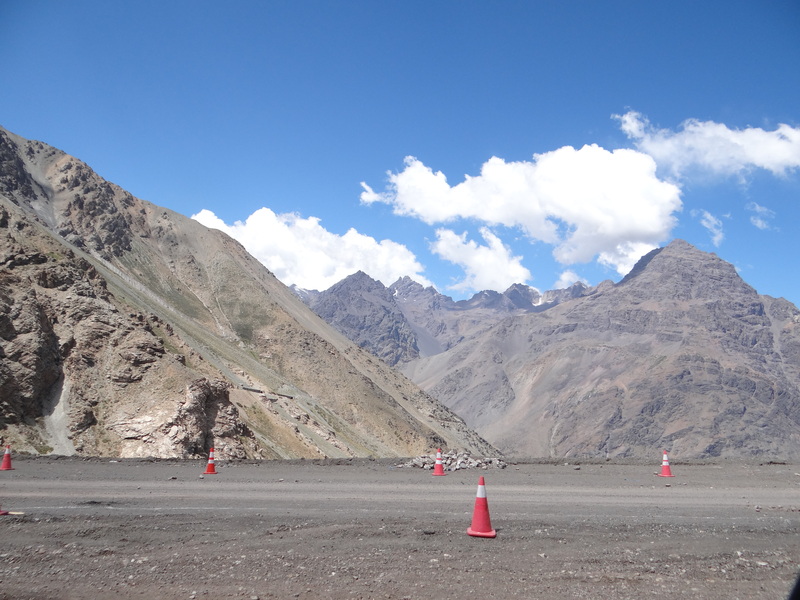 As we got close to the boarder we were now smack in the middle of the Andes. Not a lot around us except for mountains. We came upon a line of cars stopped. It was still nearly 20 kilometers from the boarder which made us think the opening was delayed. We waited for about 30 minutes when the cars started to move again. We only drove for a short time to stop again, still far from the boarder. Now it was nearing 10 p.m. so the sun was setting and the mountains were getting cold. Imagine, we were in the middle of the Andes with nothing anywhere – no McDonalds, gas stations or anything but sharp cliffs. We began moving again, creeping slowly. Before you cross the boarder, you literally climb up the mountain, zig zagging back and forth, with nearly 23 turns to reach the top. This is the area under construction so traffic was moving very slowly. Just after we made it to the top of the mountain, now nearly midnight, we stopped. We were not sure why, but freezing cold and dark everywhere we were now worried about how long this would actually take. We finally slowly began to move, rounding a corner after more than an hour, creeping an inch at a time, to see that we were filing into the line for Customs. Only moving a few feet every 20 minutes, John and my mom got out of the car and walked forward to check it out. Now nearly 1 a.m. they counted we were 68 cars back from the checkpoint. John decided to get some sleep and I inched the car forward moving two feet once every 15 minutes. We did this from 1 a.m. until 4 a.m. when we finally reached the customs checkpoint. It was agony. Not a surprise, the Murnanes didn’t have their paperwork in order. We can’t find the proof that we paid the reciprocity fee to enter Argentina ($160 per person) even with the stamps on our passport from our previous trip to Argentina. We also realized we had only the previous owners paperwork for our car – nothing showing that we actually owned the car. Thankfully I had my computer so after much searching I found the documentation that we had paid the reciprocity fee. The guards stamped our paper and we headed out happy to have avoided any questions about the car. it was now nearing 5 a.m. and we still had a three hour drive ahead in Argentina. After finally driving at a normal speed for about 30 minutes we came to a check point on the highway where one guard was stopping all cars. He indicated that he needed our form from customs with three stamps – which we apparently didn’t have. After much conversation in broken spanish, it was clear he was not going to just let us go. He insisted, without hesitation, that we needed to turn around and go back to customs. By that time, our spirits were broken, we were beyond any rational thought, but the idea of turning around and going back to the place we had just spent nearly 6 hours seemed like a cruel joke. But what choice did we have? We turned around and headed back to get our three official stamps. The process took almost 45 minutes – and thankfully for the grace of one customs worker who saw our car paperwork and deduced that we had likely not just stolen our car but that we were simply clueless Americans – we headed out for the second time at almost 6 a.m.
With John driving, I slept for an hour while we made our way toward Mendoza. As we neared the city, we hit a bit of rush hour traffic which seemed hardly possible given we had left Santiago at 6 p.m. the prior evening. 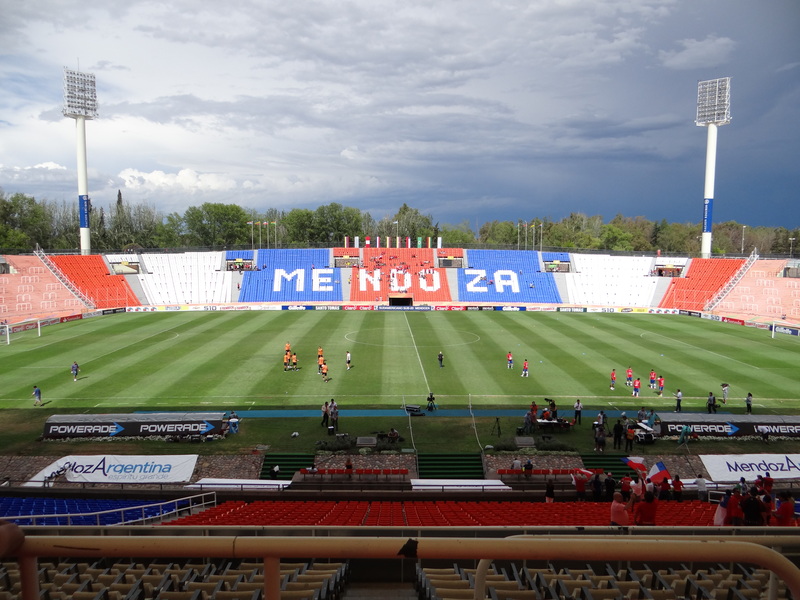 As we finally acknowledged that we reached the city of Mendoza we clocked it as a 14 hour journey. If someone had suggested the four of us get in a car and drive straight through the night with no sleep through the Andes mountain range on a trip that would take 14 hours I would have laughed. It hardly seemed possible that we made it. 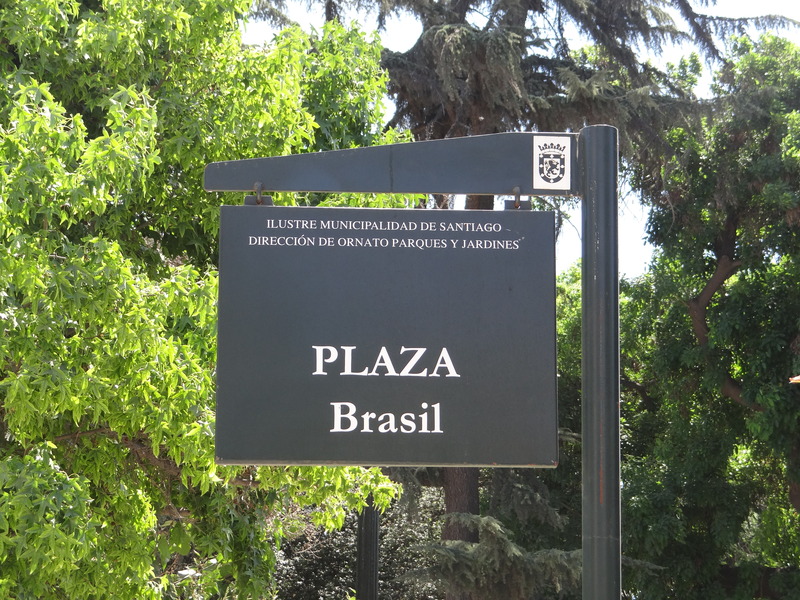 We found our hotel, the Park Hyatt , which sits right on the main square in the heart of Mendoza. We made the determination that we would not sleep but push on to taste some wine. 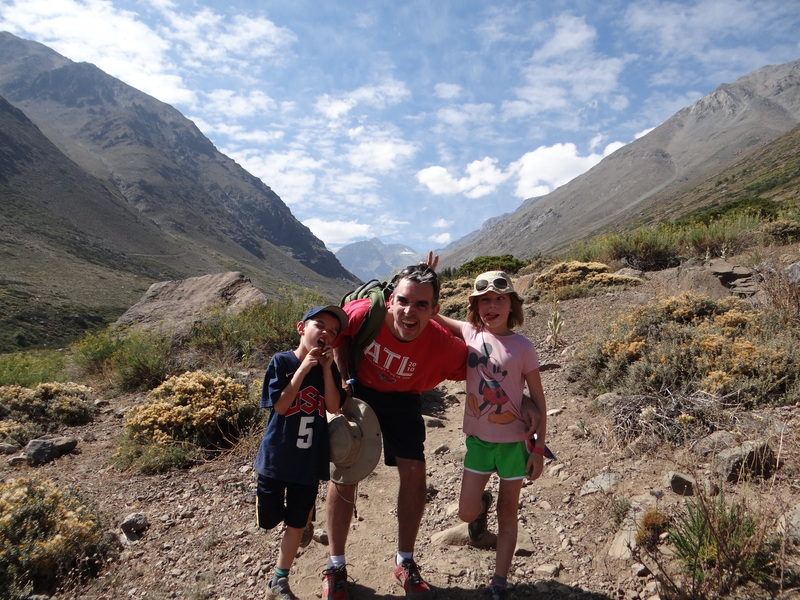 We had only 3 days in Mendoza and we needed to make that long trip worth the time (If at all possible). 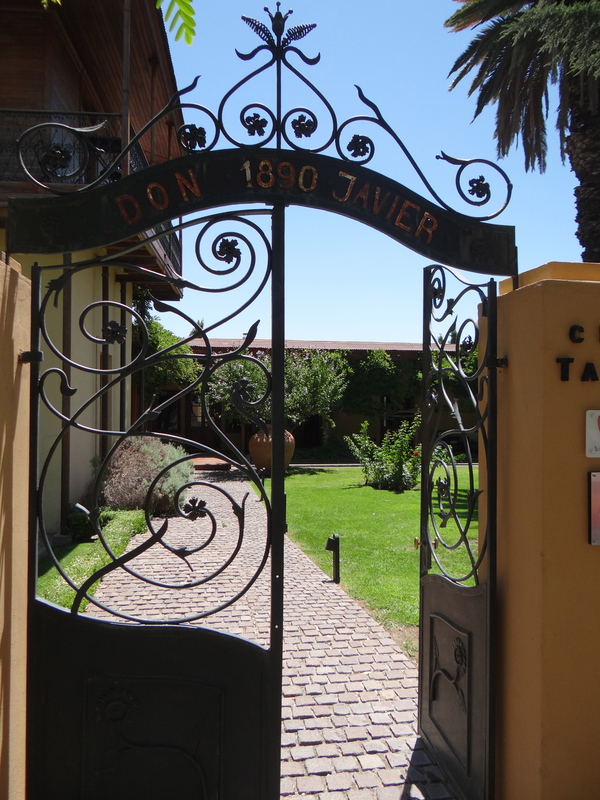 We hired a car to take us to two wineries: the first was Casa Del Visitante where we got a tour and taste of Family Zuccardi wines. 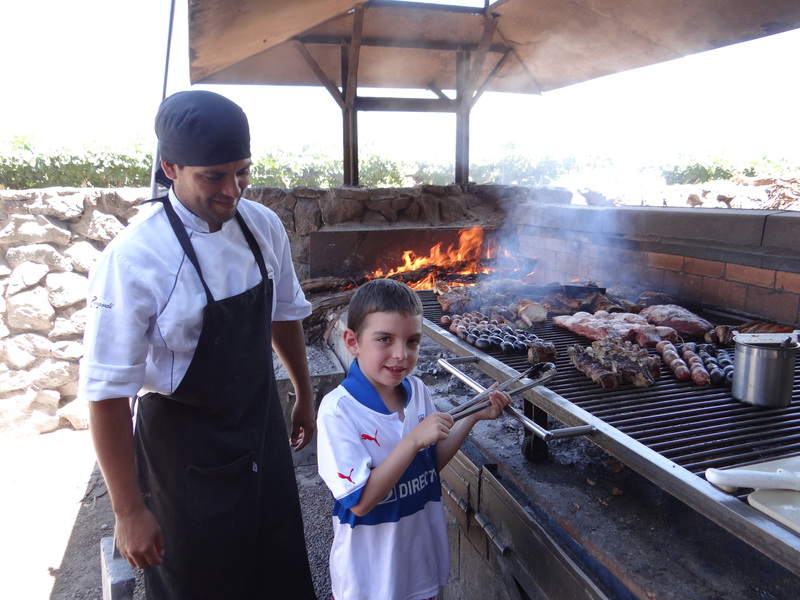 We had a wonderful classic Argentinian barbecue at their restaurant which was spectacular and included delicious Argentina empanadas. 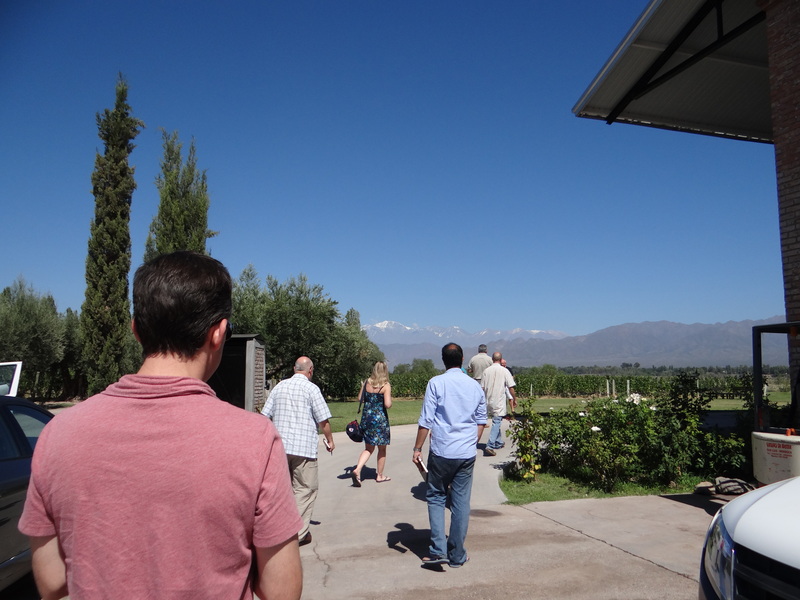 We then headed to a boutique winery Carinae where we toured the very small winery and did a wonderful tasting of many wines. Jack was a trooper the whole time (Madie was at her sleep-away summer camp so she didn’t make the trip). 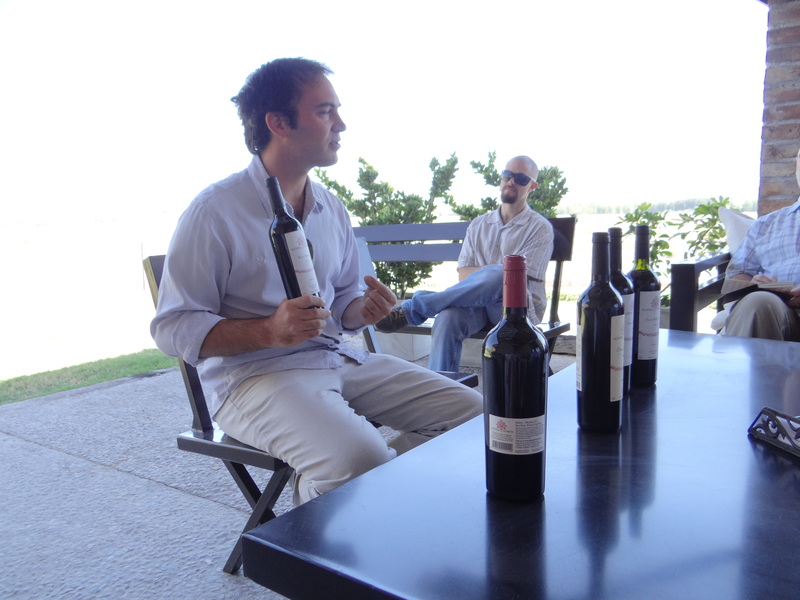 Our wine tasting at the intimate Carinae Winery. 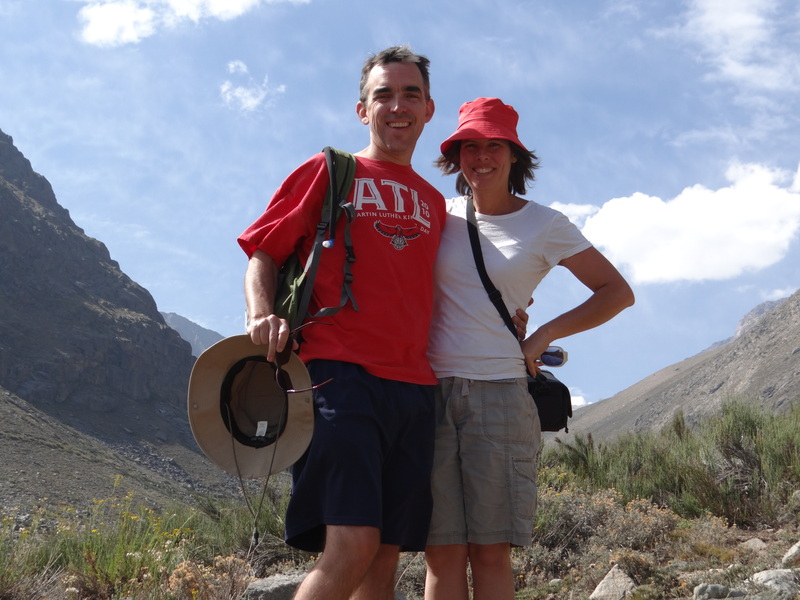 We were proud of ourselves for pushing through and not wasting one of our three days in Mendoza to sleep. We were especially proud of my mom, who managed to sleep a total of 15 minutes in the car and still hung with us the whole day. 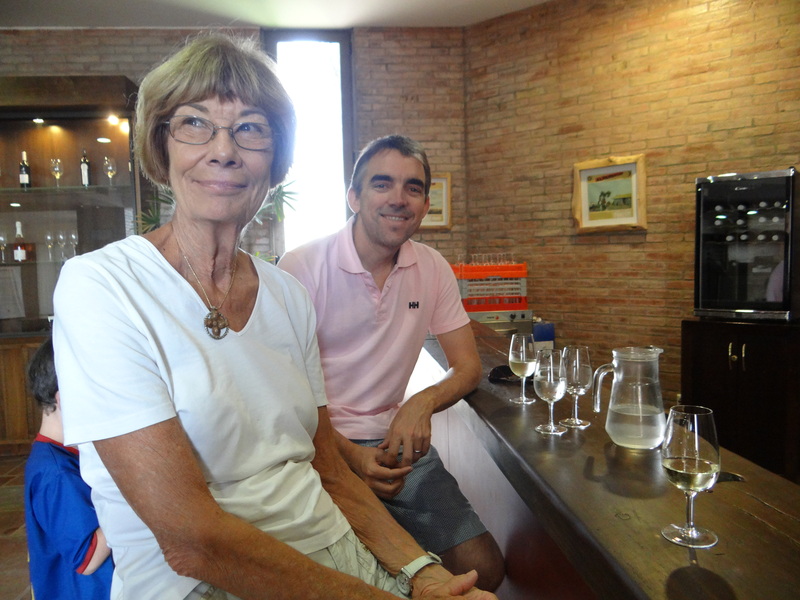 My mom and Jack headed back to the room for an early night and John and I ventured down the street from our hotel to The Vines of Mendoza which is a wonderful wine bar/tasting room that features any and all wines available in Mendoza. The next day, John and I got to do a tour with Trout & Wine a fantastic tour company. They picked us up from our hotel and we visited four wineries with a very small group. 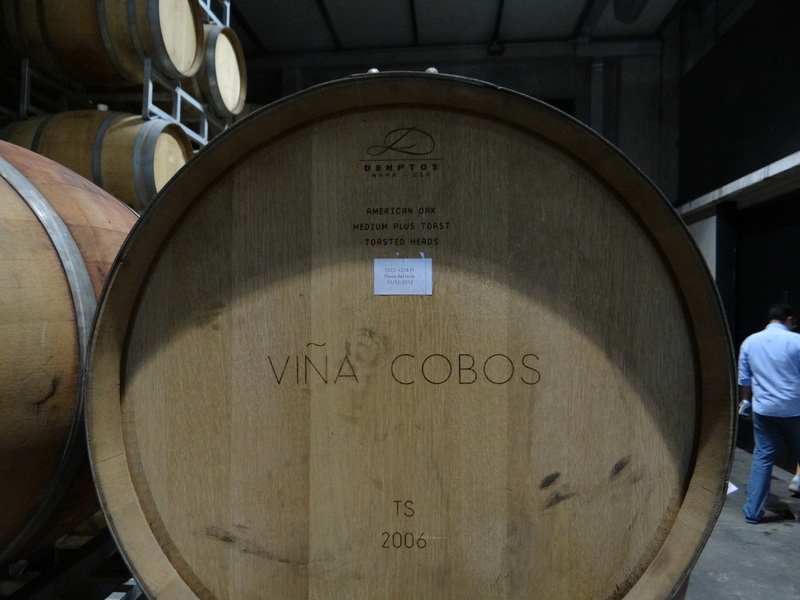 The wineries we went to were some of the best in Mendoza, Vina Cobos started the day with great Malbecs and a really wonderful Felino Chardonnay. 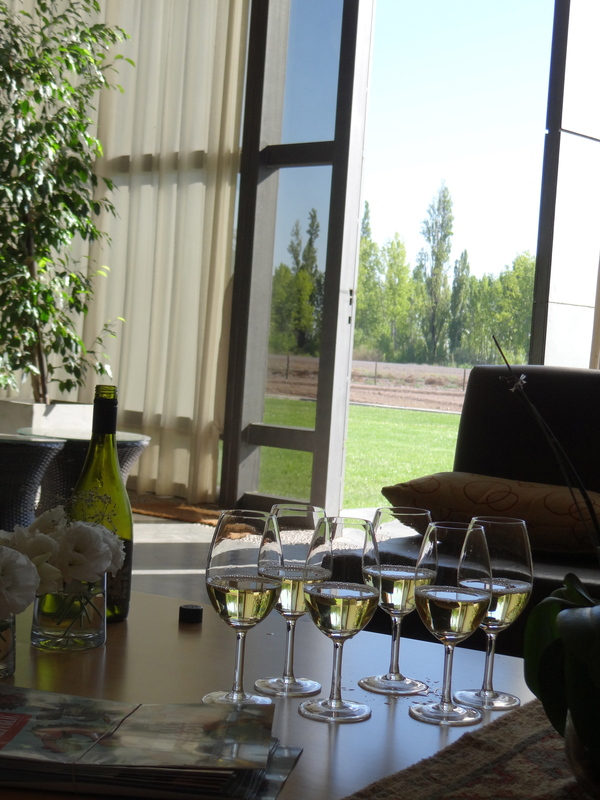 It was really interesting to taste the different wines that were the same grape but just grown in different locations of the vinyards in Mendoza. 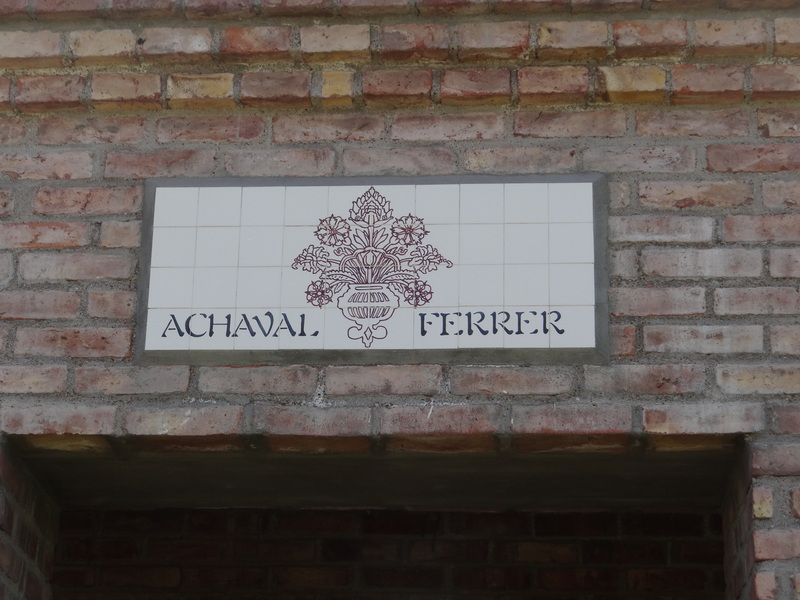 Achaval Ferrer was my absolute favorite wine and winery. The backdrop was fantastic as we did our tasting outside. 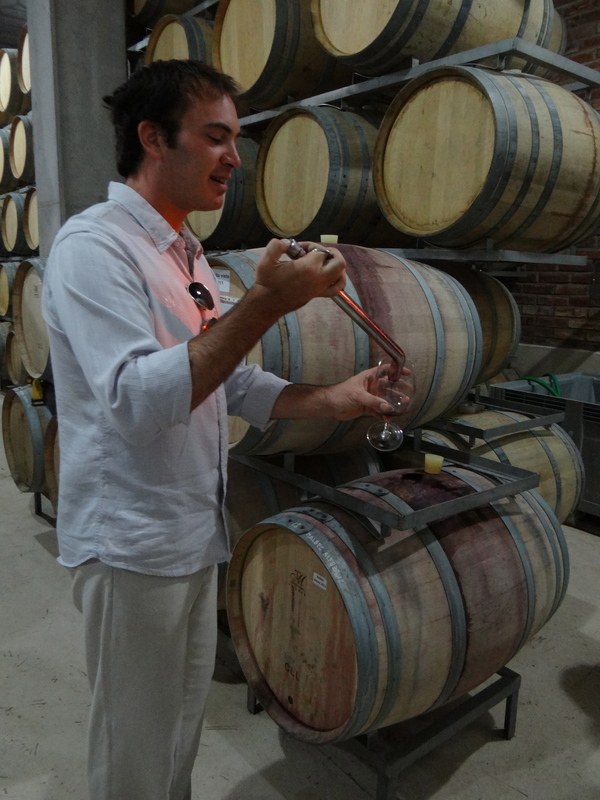 We then got to go down into the cellar and actually taste from the barrel – something I had never done before. The wines were spectacular, if indeed out of our price range. 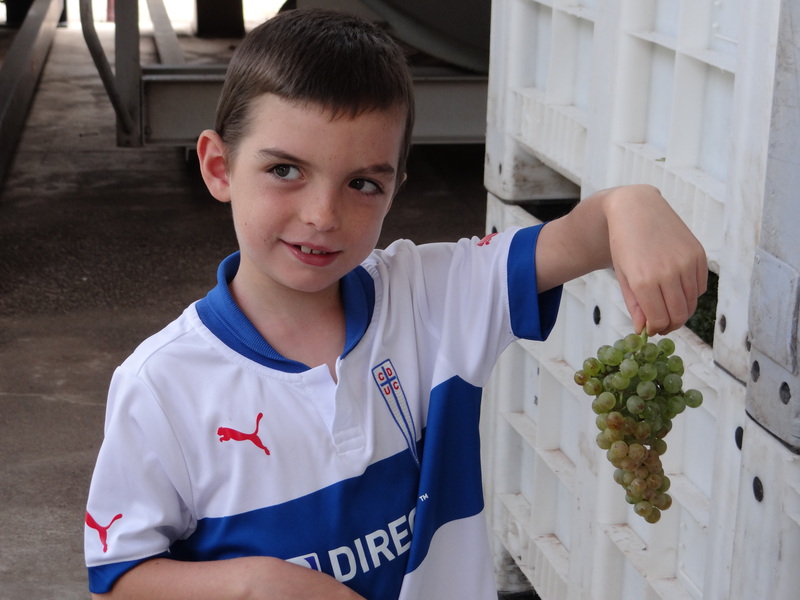 We learned that they actually trim down the grape clusters just before Harvest (which is in late Feb/early March) in order to concentrate everything into the best grapes. 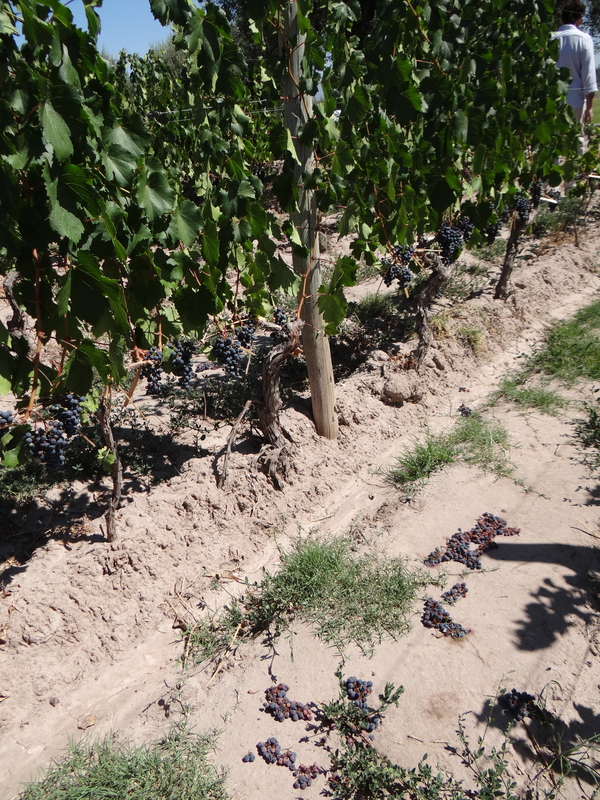 Amazing to see they just leave what appear to be perfectly good grapes on the ground to fertilize the others. 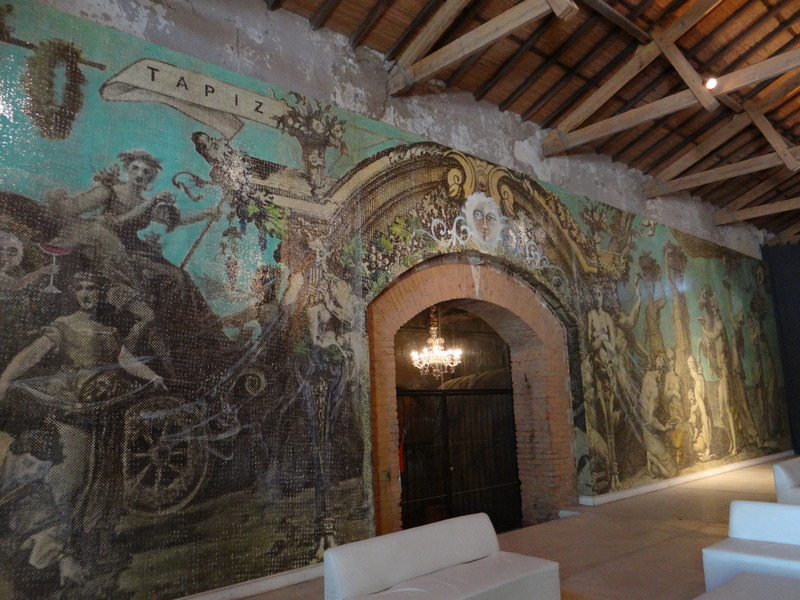 Next, we visited a very old winery that is now a restaurant and small hotel, Club Tapiz. 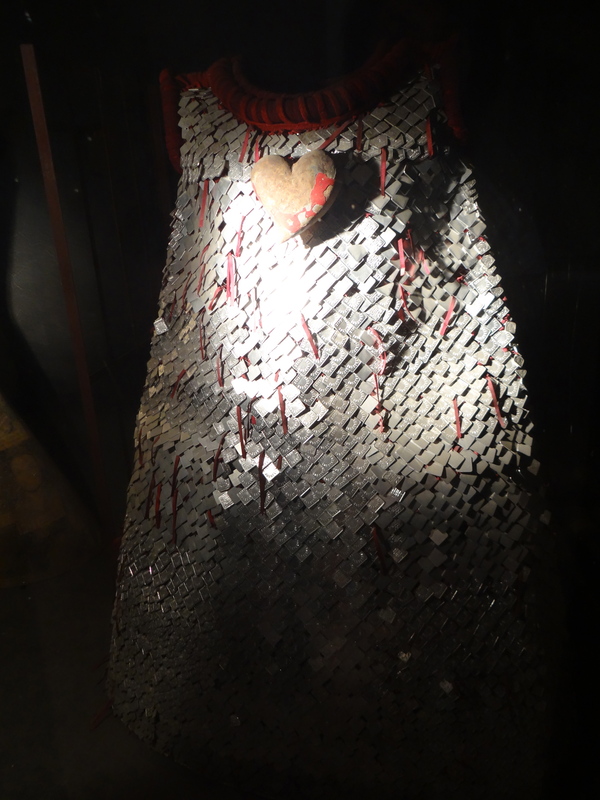 We had a chance to tour the old winery where we saw the old barrels, a beautiful mural and some old dresses made to represent the history of wine harvests in Mendoza. We had lunch in the second story of a beautiful old building and each course was accompanied by the wines. Our group consisted of a couple from Ottawa, Canada, a gentleman from England and a young woman from the Netherlands – a super interesting group to spend the day with. 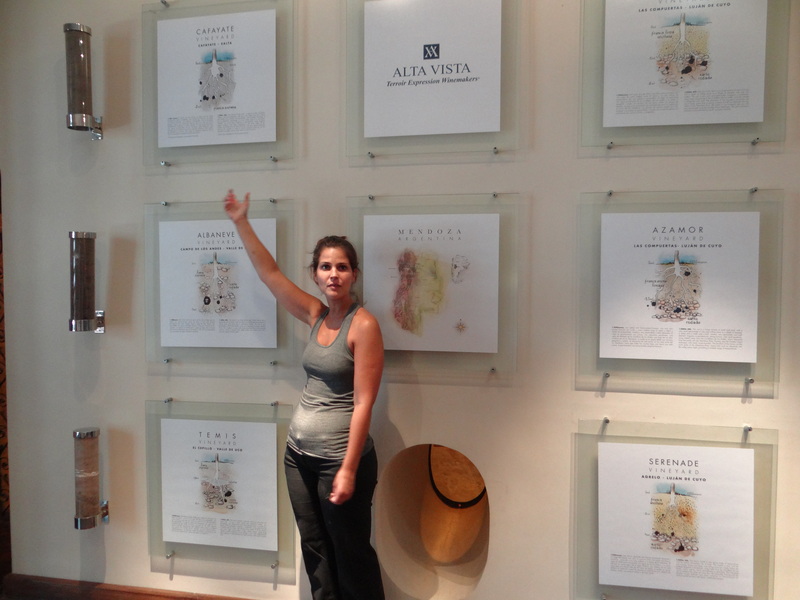 We ended our day at Alta Vista which offered a interesting blend of old and new wine traditions. 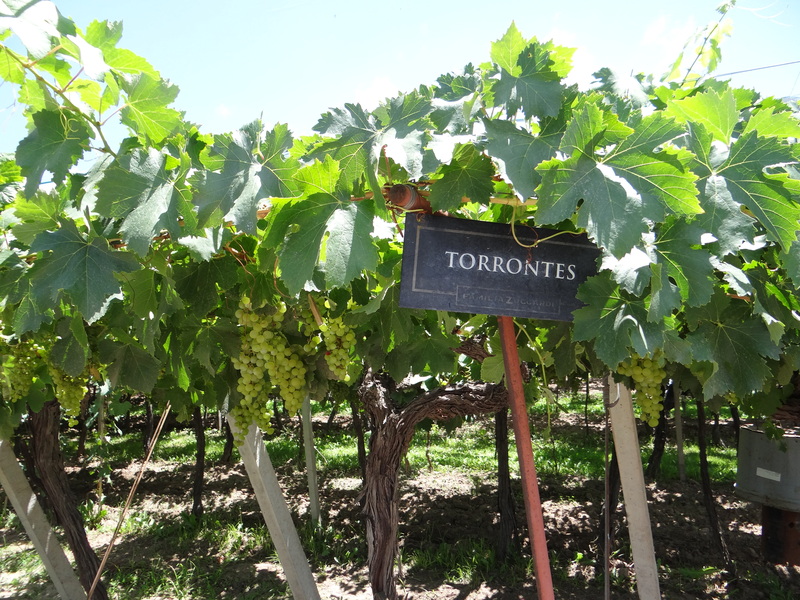 They have a highly rated Torrontes which is a grape only grown in the north of Argentina in Salta. 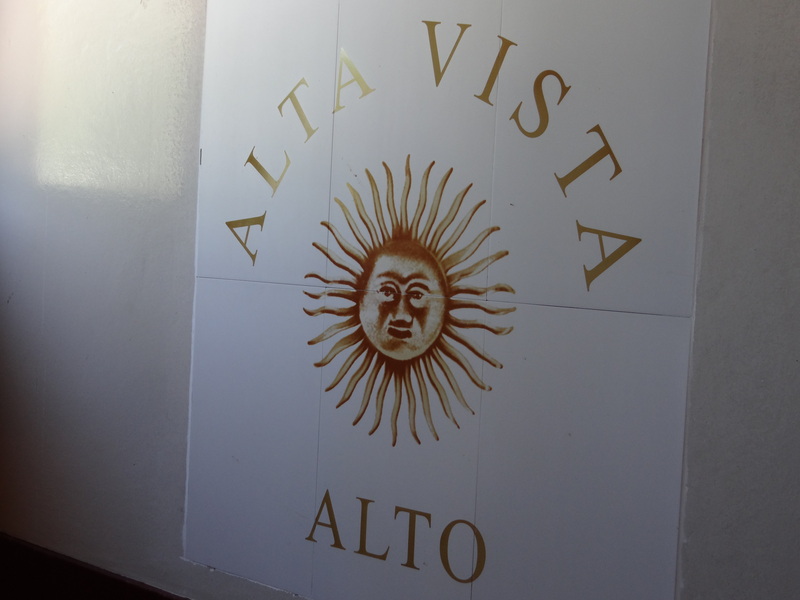 But in Mendoza, Malbecs rule and Alta Vista is most known for their Alta Vista Alto wine which was indeed delicious. 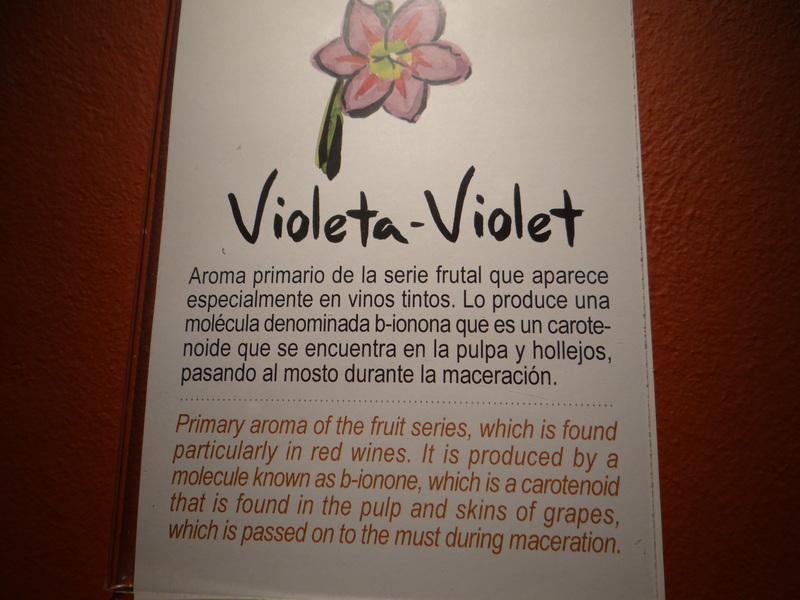 Our last day in Mendoza we spent the morning visiting one last winery Belasco De Baquedano which we thought would be fun because they have an aroma room where you can test your senses to identify different wine characteristics. The winery itself has beautiful views and great wine. 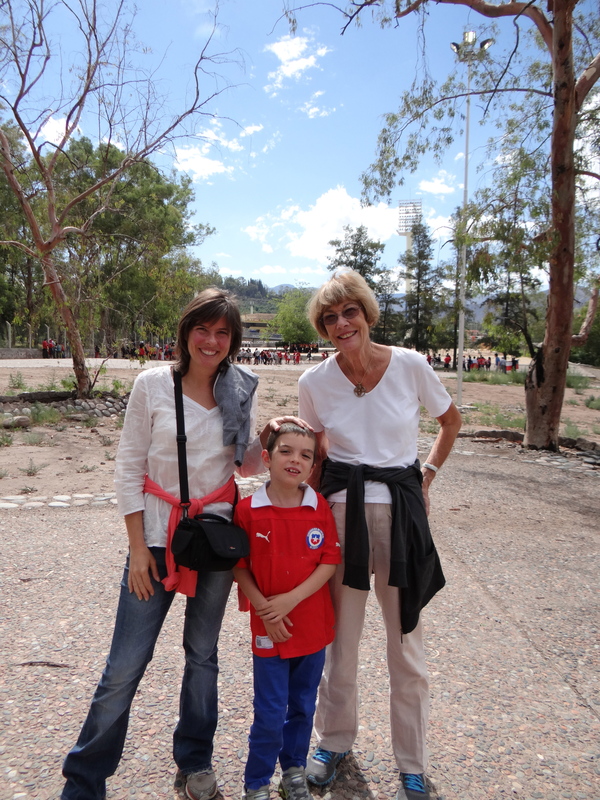 After the winery visit we got ready to go to the Chile vs. Urguay Sudamericano Sub20 tournament. Chile had been playing really well and given that the national men’s team has not been playing well, everyone was getting excited by the this younger group suggesting some potential for the future of Chilean Futbol. The Uruguay team was also staying at the Hyatt Regency Mendoza and the hotel was kind enough to give us some spectacular tickets. 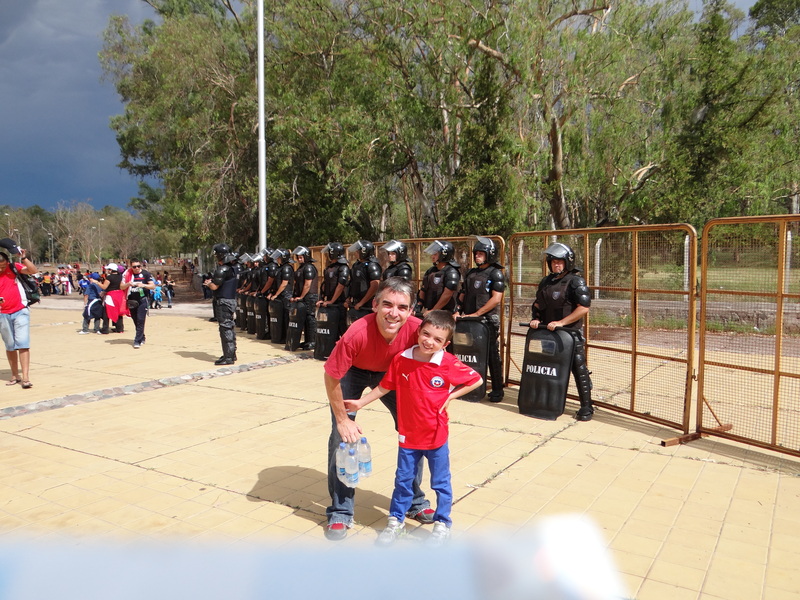 We couldn’t decide if the strong police presence at the stadium made us feel safer or suggested we should worry, but everything was perfectly fine. Unfortunately, Chile lost the match 1-0 Uruguay. Jack was very disappointed, expecially when we returned to the hotel to see the Uruguay team bus pull up at the same time filled with celebrating under-20 year-old boys. 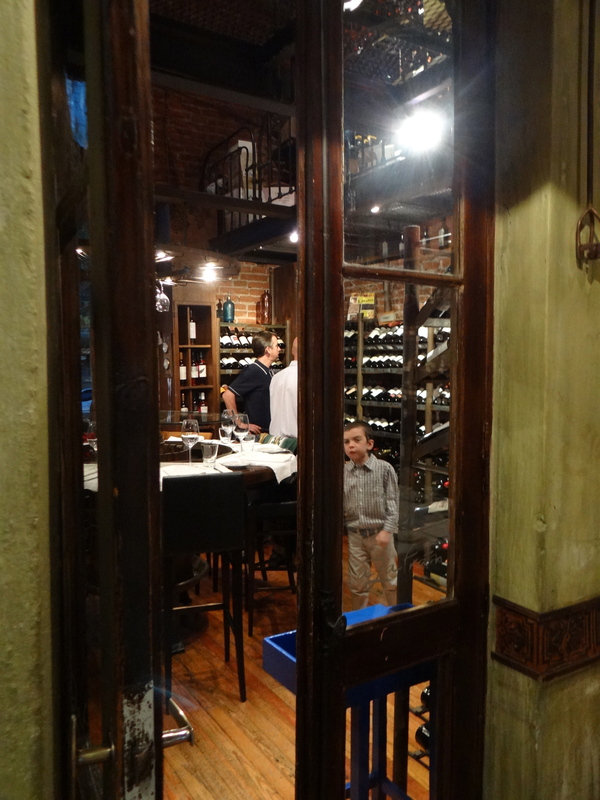 But we had one last fantastic meal in Mendoza at a small restaurant named Azafrán Restaurant which was terrific. The small restaurant has their own wine cellar rather than a wine list so you actually go with the sommelier to pick out your wine. You can only imagine how nervous we were to start our long drive home. 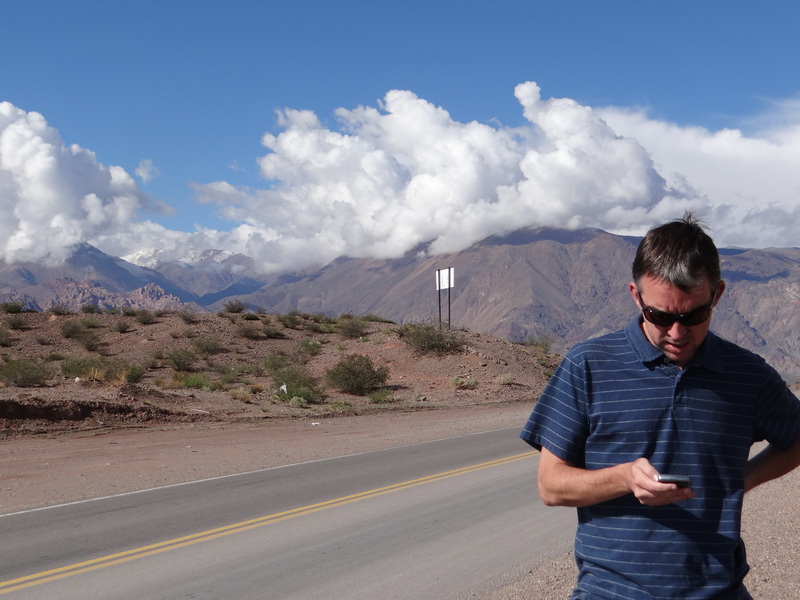 We all secretly assumed that the drive could never be as bad as the trip to Mendoza but we were all too scared to say anything out loud just on the off chance we might jinx it. 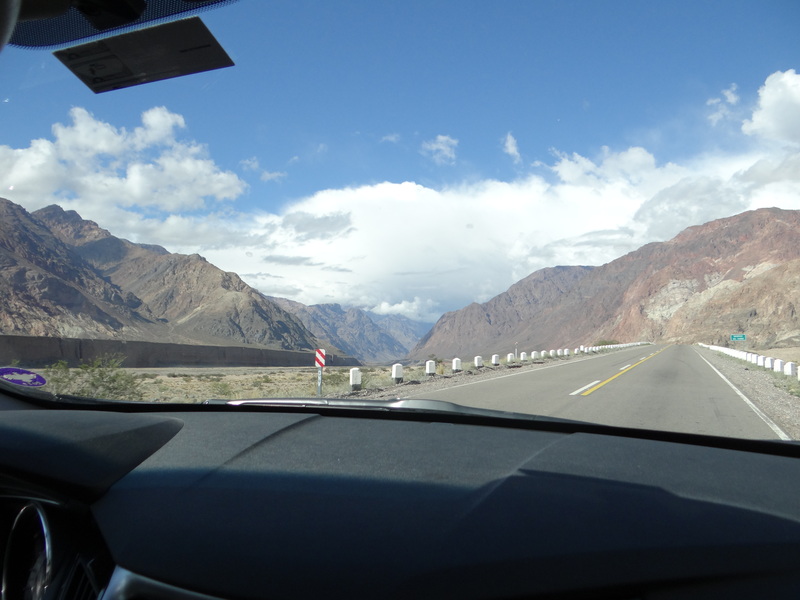 We also took solace in the fact that we could see the beautiful mountains since we would be traveling during the day. 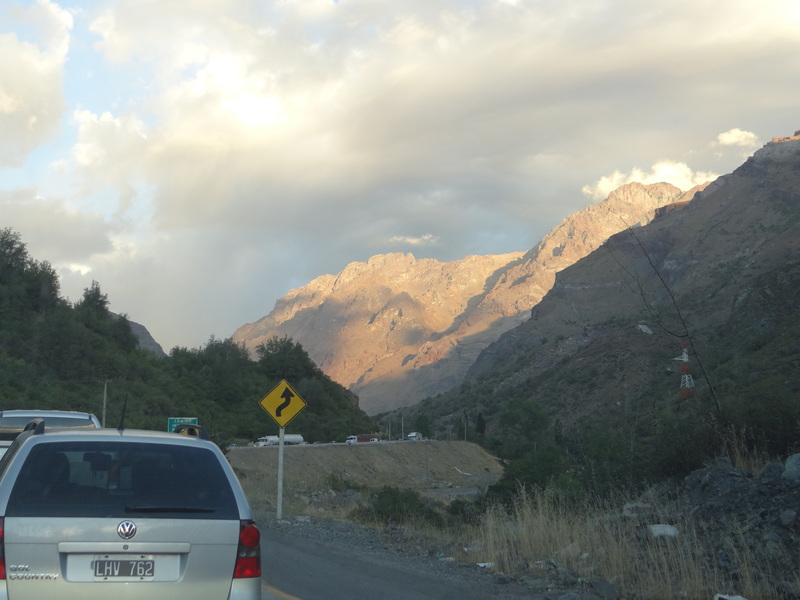 Everyone had told us part of the reason to make the drive was the view driving through the Andes. We headed out after breakast and thankfully had an uneventful time back. Customs heading into Chile took 10 minutes and even the few stops we had to make at the construction once in Chile only lasted a short time. 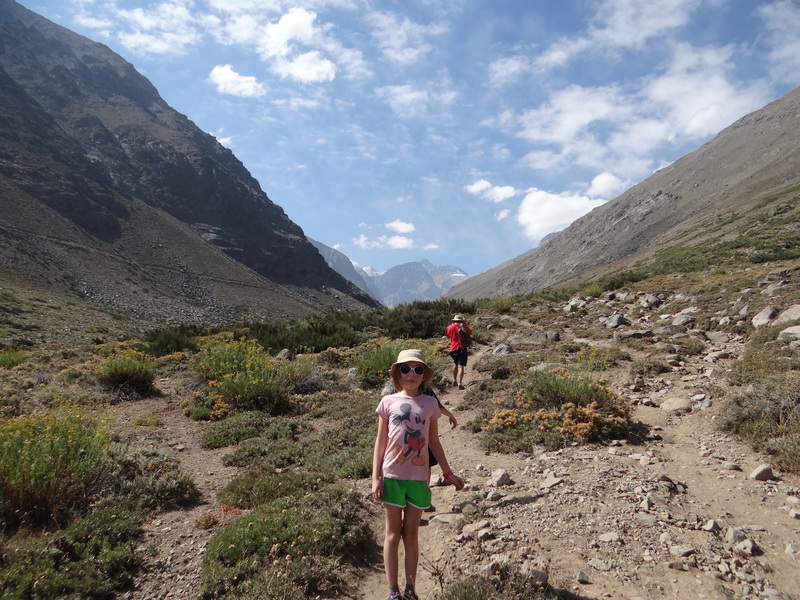 We made it home in 7 hours – half the time it took us to get to Mendoza. It was a tremendous trip. Would we do it again even with the tough journey….No. I will never again drive into Argentina. 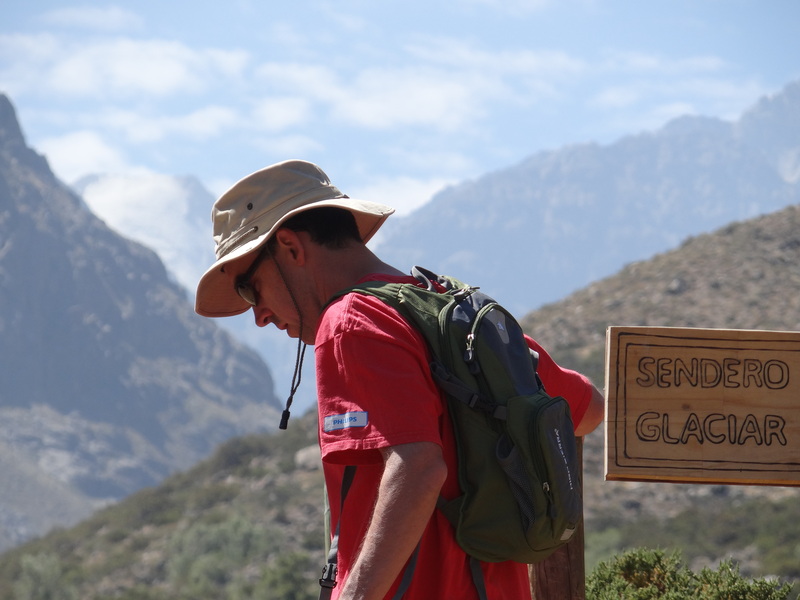 But, I will make sure to go back to Mendoza. Just take a plane next time. 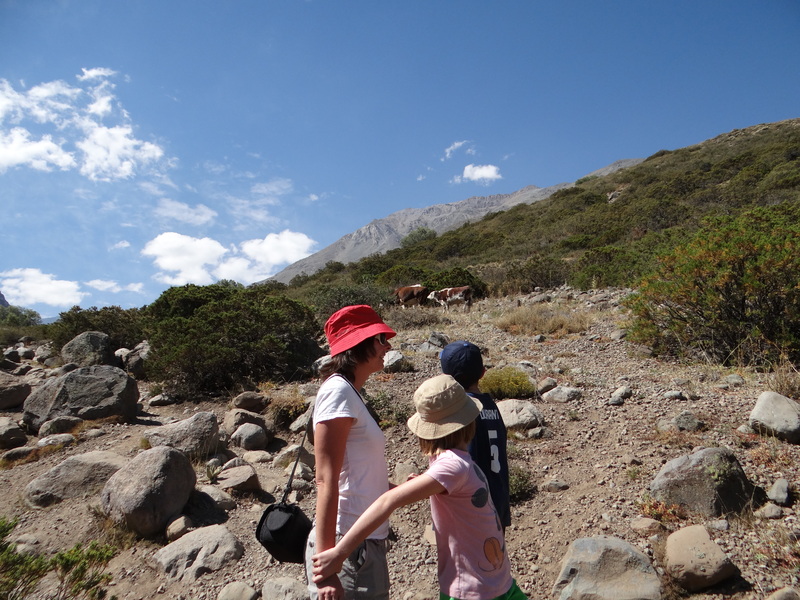 On our summer vacation, we went to Argentina. 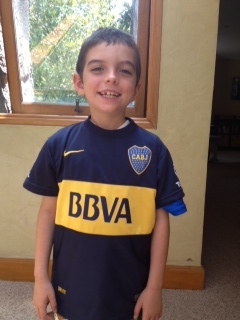 While we were in Argentina we heard about the Boca Juniors playing River Plate. It was a soccer game. 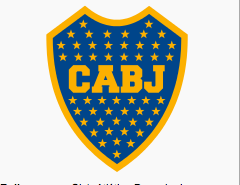 CABJ stands for Club Atlético Boca Juniors. 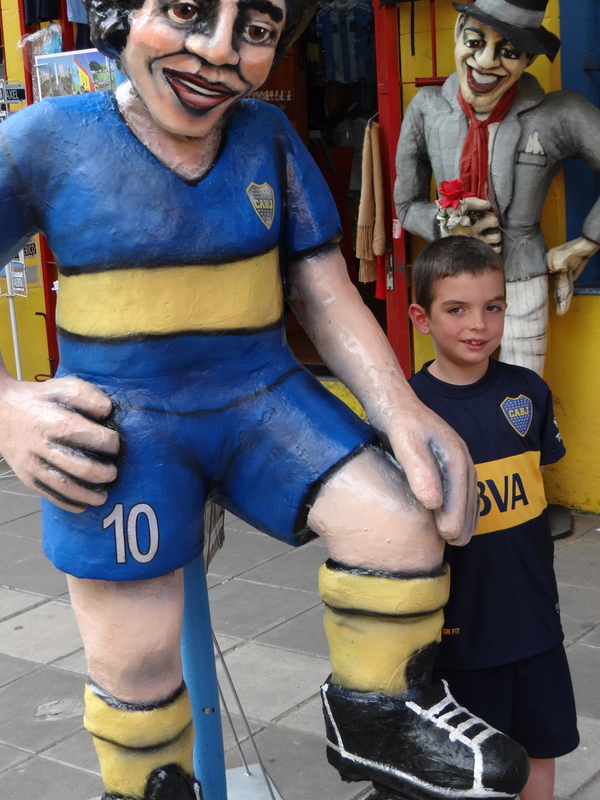 It is a soccer team in Buenos Aires that plays in a neighborhood called La Boca. It is one of the best teams in the world. They have won the Argentina championships 25 times and have won 18 titles outside of Argentina (tied for most with A.C. Milan). Boca Juniors has a big rivalry with River Plate. 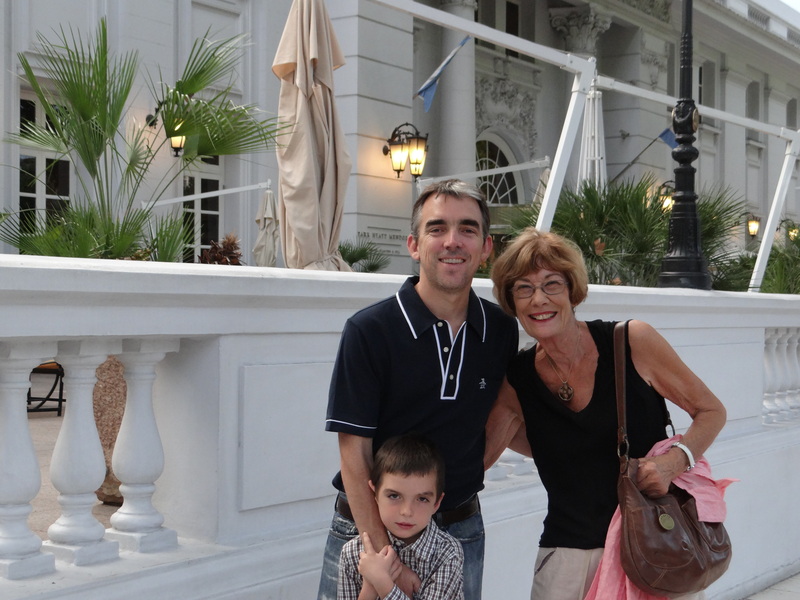 Our tour guide in Buenos Aires told us a great story about how the rivalry started. 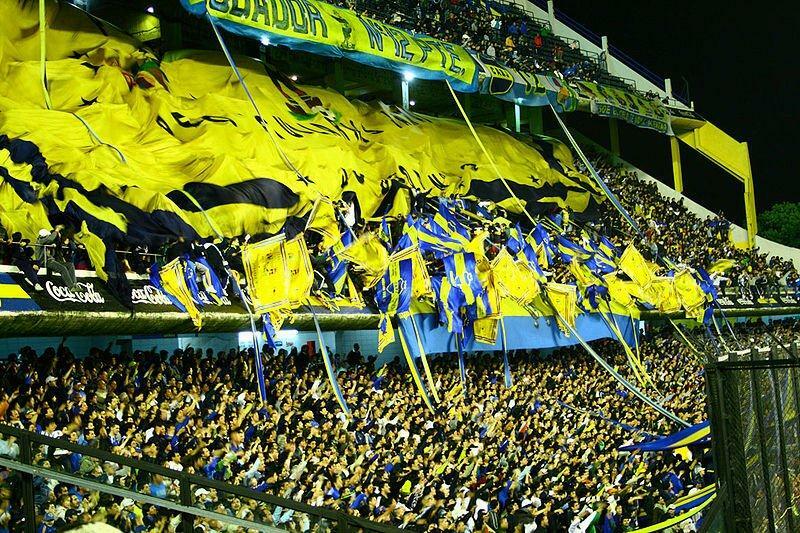 It started when Boca Juniors and River Plate both wanted the stadium in La Boca. So they decided to play a game … and said that the winner gets to stay and the loser has to go. Boca Juniors beat River Plate (she said 3-0) and River Plate moved to the North of Buenos Aires and built their own stadium. Boca Juniors couldn’t decide what their colors should be. They were fighting and fighting. I want red. I want blue. Finally, they said the first boat that comes, the colors on the boats flag will become our colors. The next morning, a boat came in and the colors were blue and yellow because the boat was from Sweden. So their colors are now yellow and blue like you see in my shirt. This is a photo of Boca Juniors fans watching a game. I think this is how they celebrate when they score a goal. 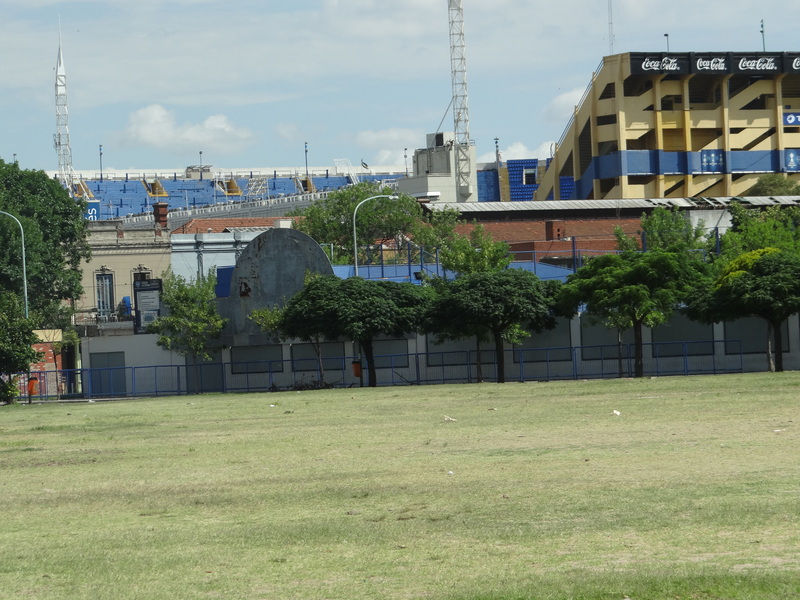 Here is a picture I took of their stadium in La Boca.